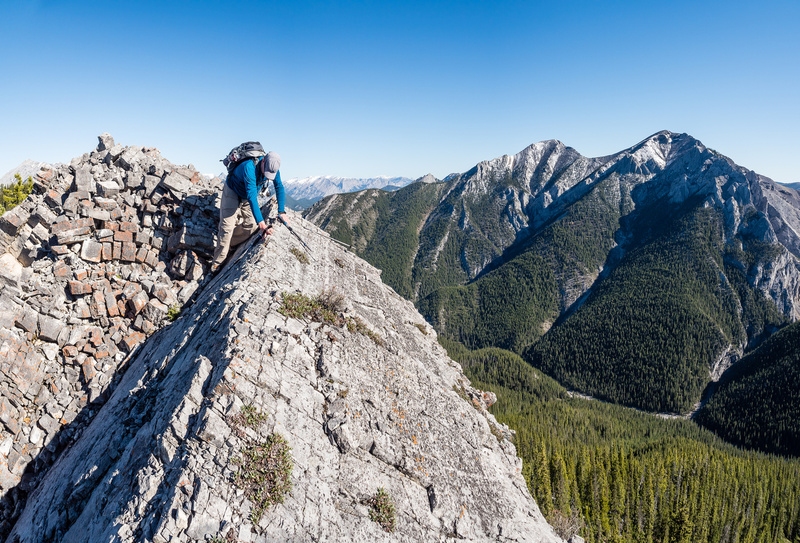 Difficulty Notes: A long traverse with moderate scrambling on the northeast ridge of Midday – definitely easy to upclimb than downclimb. 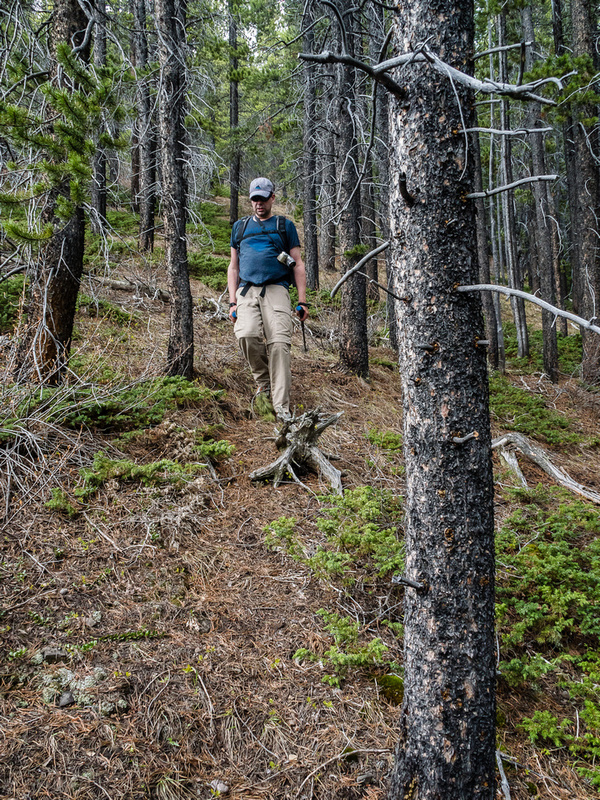 On Saturday, May 19, 2018, Wietse and I finally completed a nice front range hiking / scrambling loop that I’ve been eyeing up for several years. 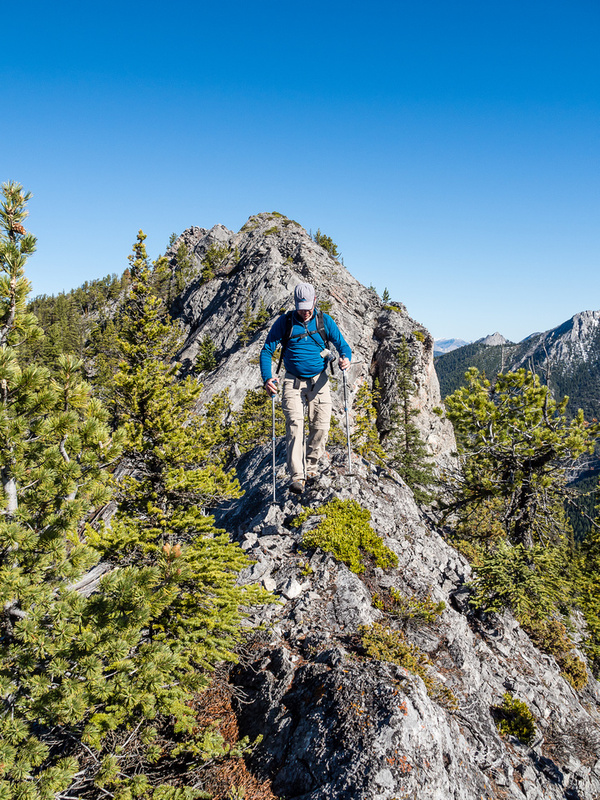 The loop starts with an pleasant hike / easy scramble up Porcupine Ridge before leading over moderate terrain to a few more summits west of Tiara Peak. 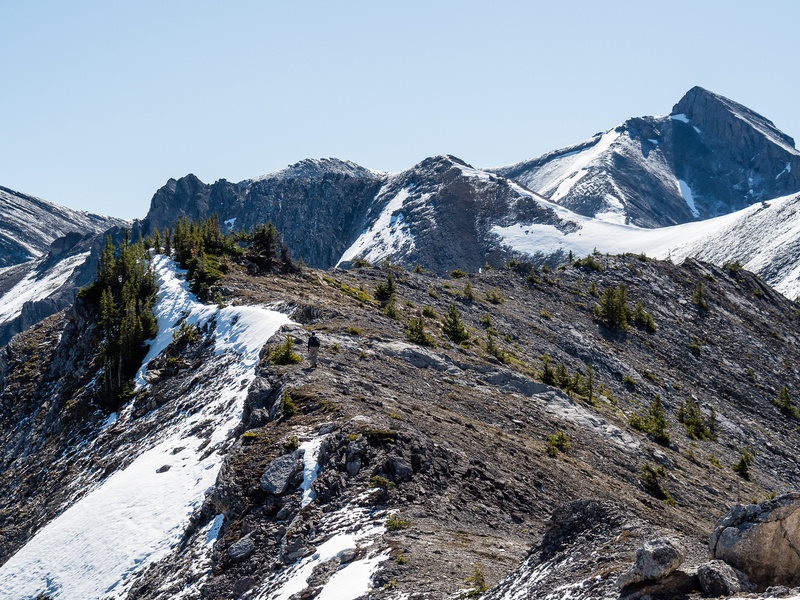 From just north of Tiara’s summit the route ascends to Boundary Peak along an undulating Boundary Ridge before finishing off with a nice moderate scramble over Midday and Midnight Peaks. 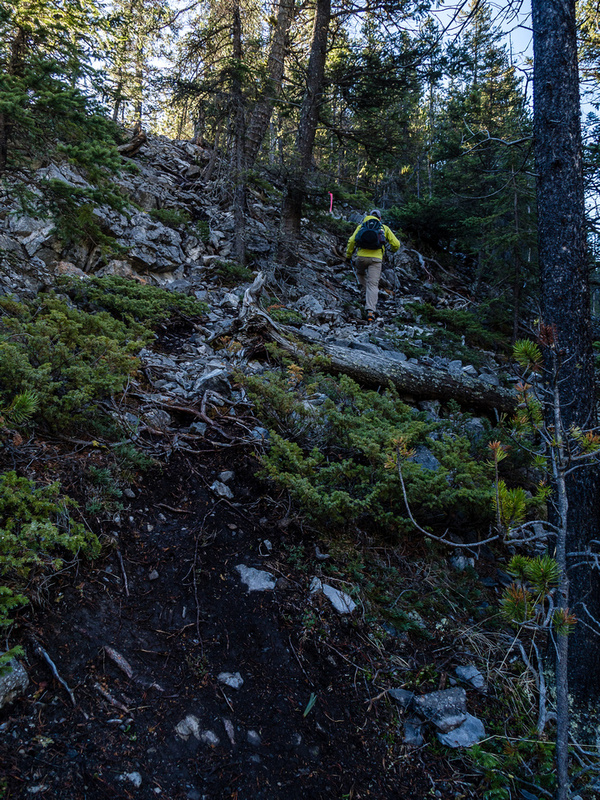 We finished our loop a bit differently than most folks do, choosing to descend easy and very pleasant slopes back into North Porcupine Creek and rejoining our approach. We fully expected to either catch up or at least see a large group ahead of us, but for the next few hours we didn’t. We also didn’t see evidence of recent tracks, which also confused us. 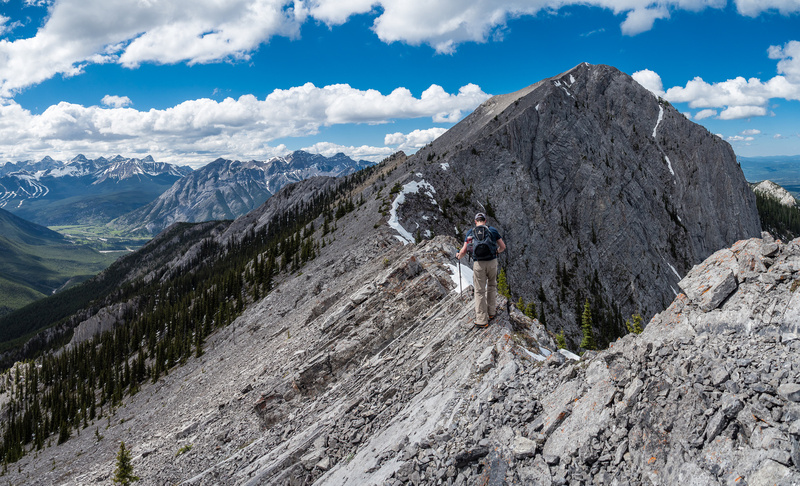 We pondered the meaning of it all while we grunted our way up Porcupine Ridge. 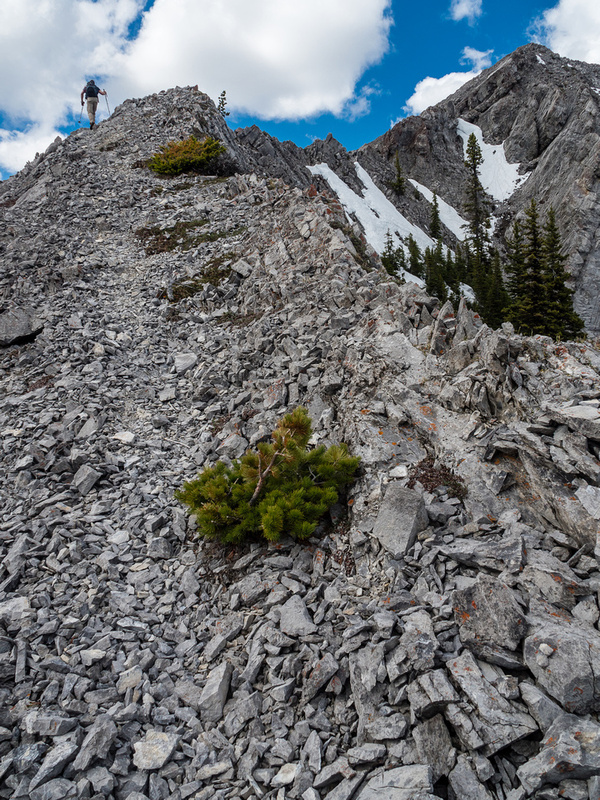 The ridge is similar to Wasootch Ridge, which I’d done a week earlier, but a bit less traveled and more rustic. 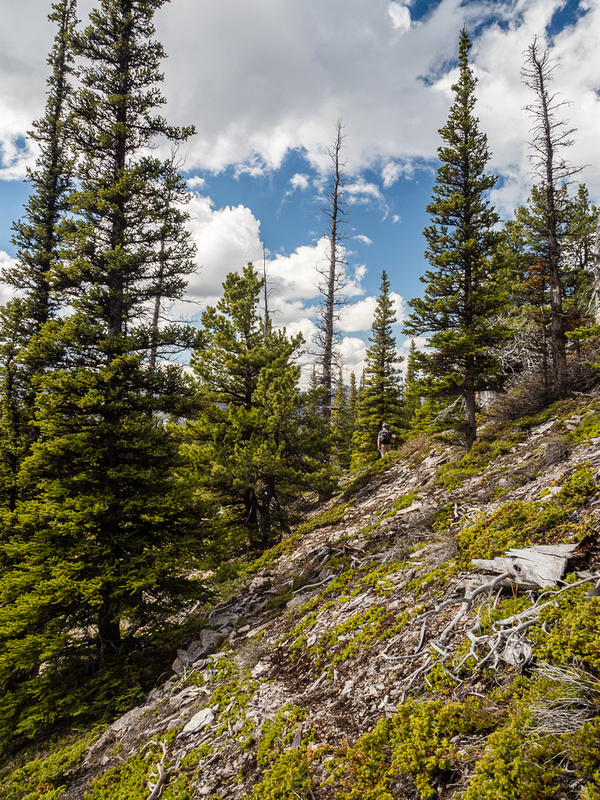 We followed a burgeoning trail up the NW end of the ridge, directly in between the joining of the North and South forks of Porcupine Creek. This track is forming into a nice trail with more and more traffic and even has the occasional ribbon. 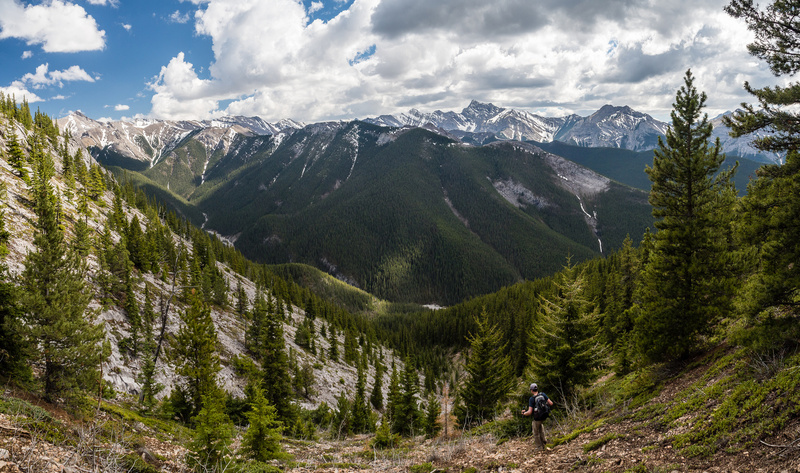 Porcupine Ridge and the trail start straight ahead of us, right where the two forks of Porcupine Creek come together. 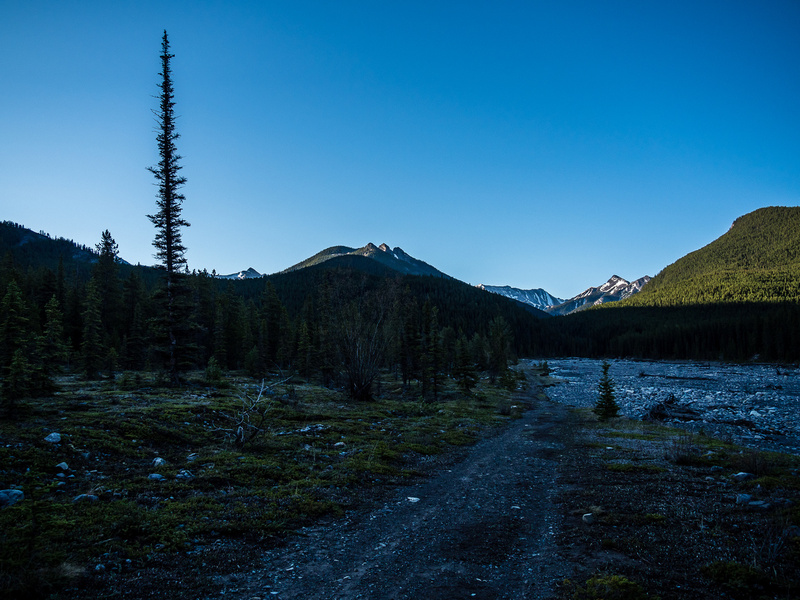 The dawn was breaking into another gorgeous Spring day as we quickly gained height in a mix of light forest and open slopes. It didn’t take long before we could start to pick out the rest of our (long) day and possible descent routes from Midday and Midnight peaks. 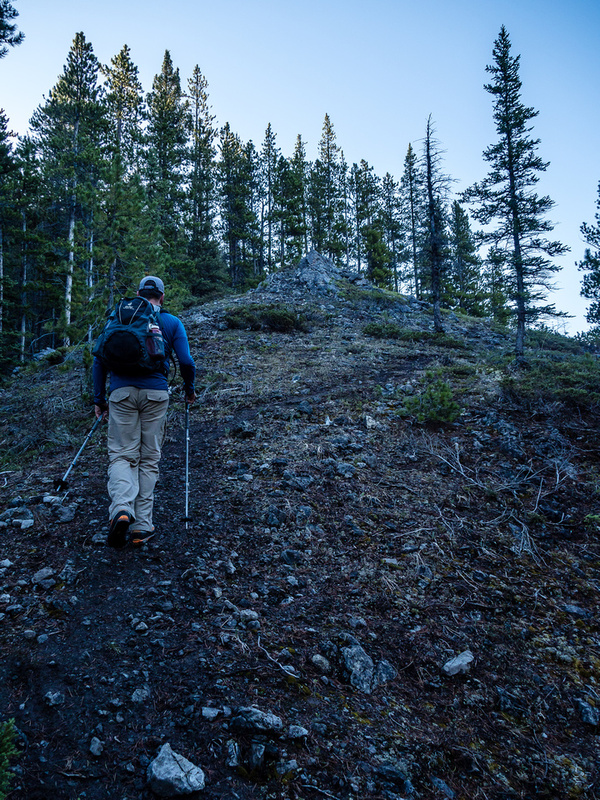 We weren’t sure if wanted to redo Midnight Peak and we weren’t sure if we could avoid descending to Baldy Pass and hiking out that trail before a 2km slog back to our vehicle along hwy 40 at the end of the day. 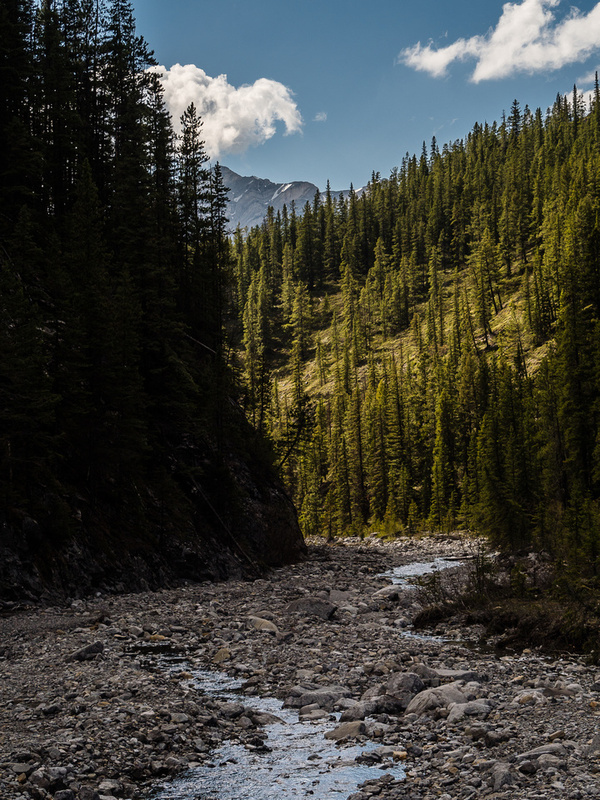 I was absolutely determined to find a nice route back down from Midday / Midnight into North Porcupine Creek in order to avoid the highway slog. Wietse was cautiously optimistic but he didn’t love my initial route choice which was a descent down the steep and cliffy SW end of Midday Peak. But there was still PLENTY of time to debate our descent! We weren’t even on the first summit of the day, never mind the 5th or 6th. It’s funny. 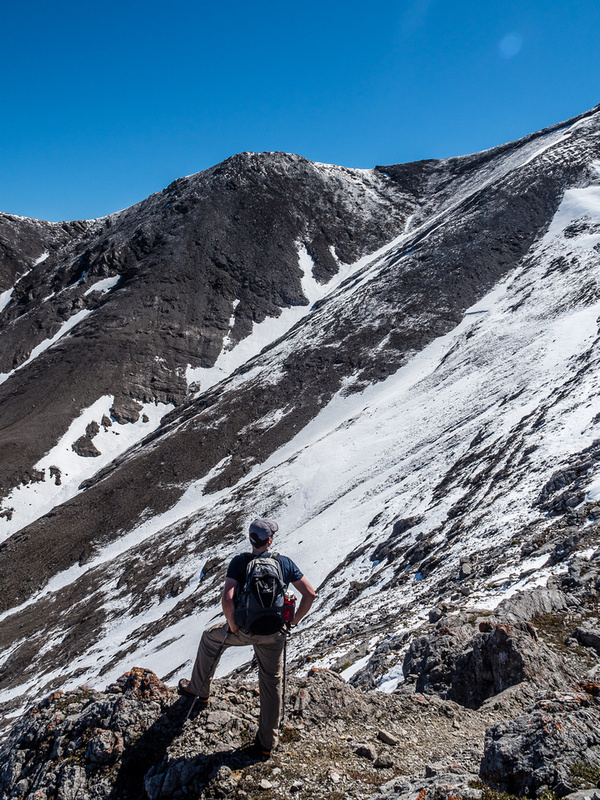 When I’m climbing 11,000ers or planning difficult scrambles I mentally prepare a lot differently for the day ahead than when I’m doing easy hikes and scrambles. For many of my early season objectives, especially this year, I’ve had very low expectations for how much enjoyment I’d get out of them. Sure! 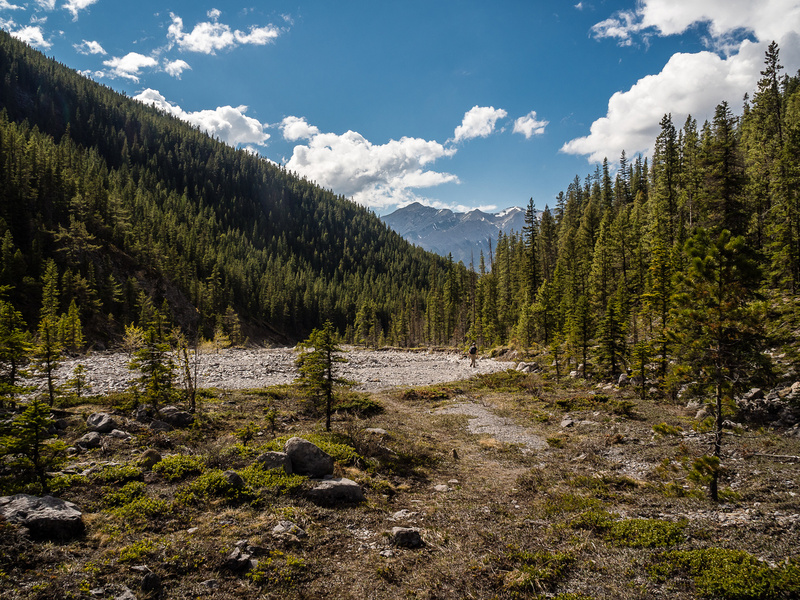 I was expecting the usual little pleasures such as warm sunshine, the smell of the pine trees and the chirping birds – but I wasn’t really expecting to enjoy the hiking or scrambling very much. 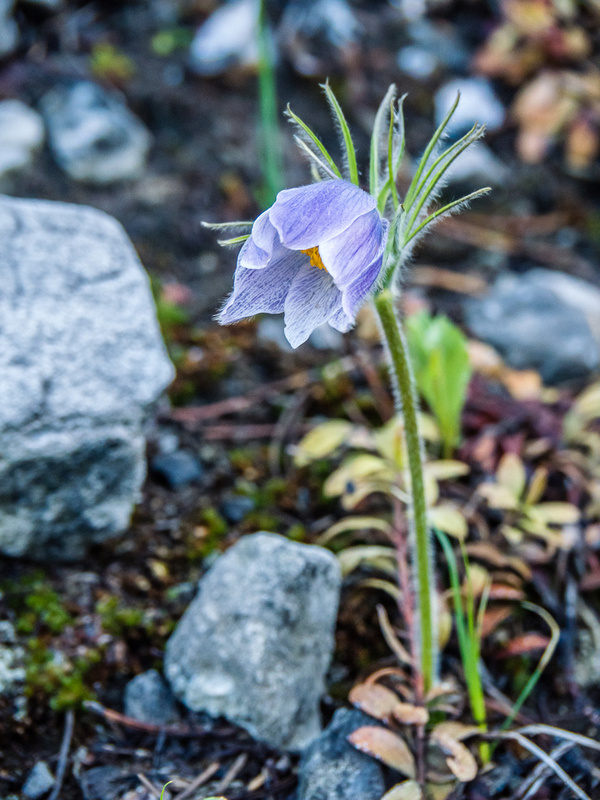 As a consequence of having very low expectations, I’ve been surprised a number of times already this year including by Etherington-Baril Ridge, Mount Mann, Stony Ridge, Wasootch Ridge and Cougar Peak. Maybe that’s a good approach to life in general? Like my sister-in-law loves to say, “lowered expectations“! 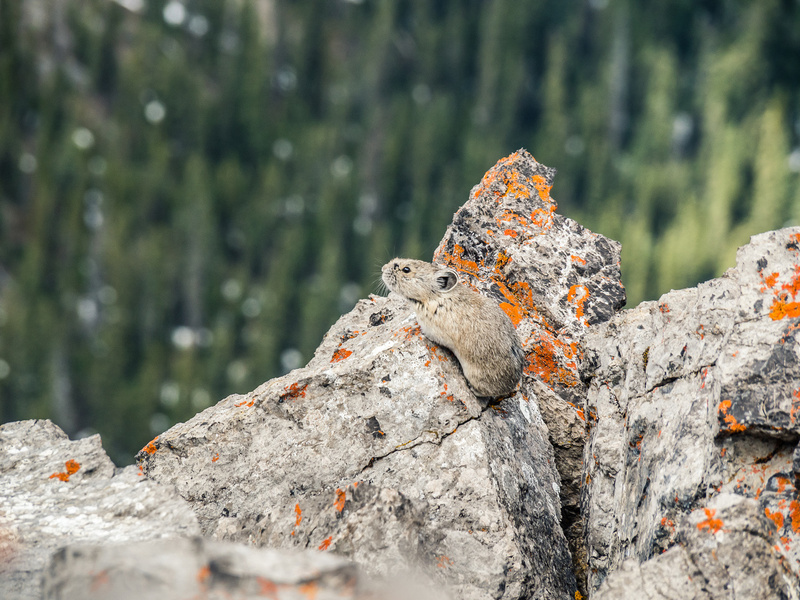 The Porcupine Loop quickly became another favorable outing. 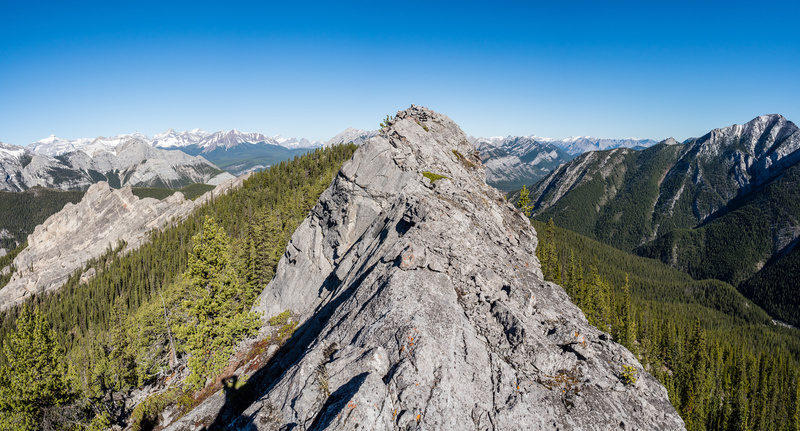 As we negotiated the easy scrambling up the infamous slab that everyone mentions, we both commented that it was a bit harder than the easier route on Wasootch Ridge, but also more engaging as a result. 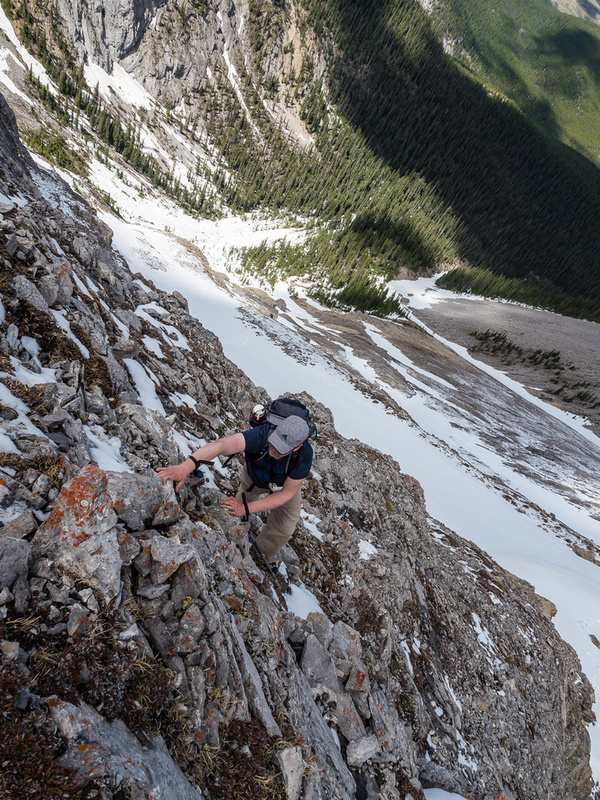 More of the easy scrambling on Porcupine Ridge. Hikers may not *love* this section. 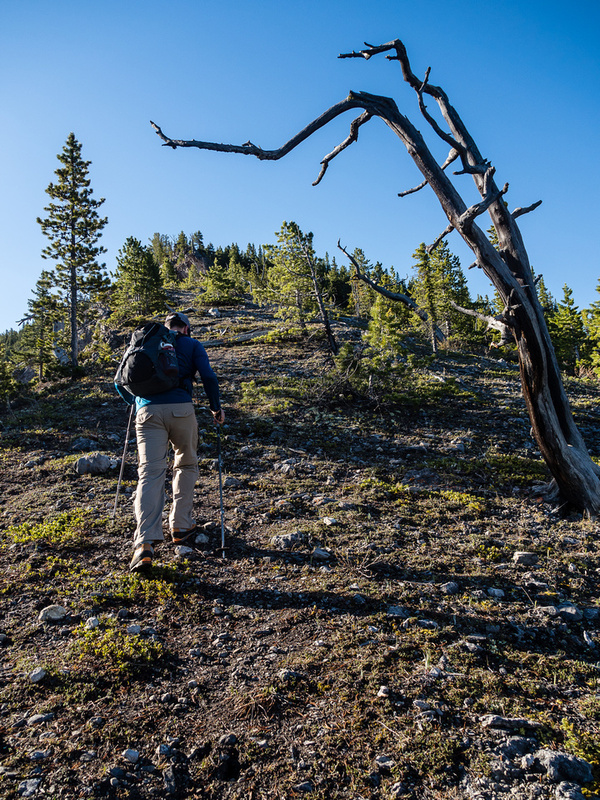 There’s some really pleasant ridge hiking even to the first summit of the traverse. 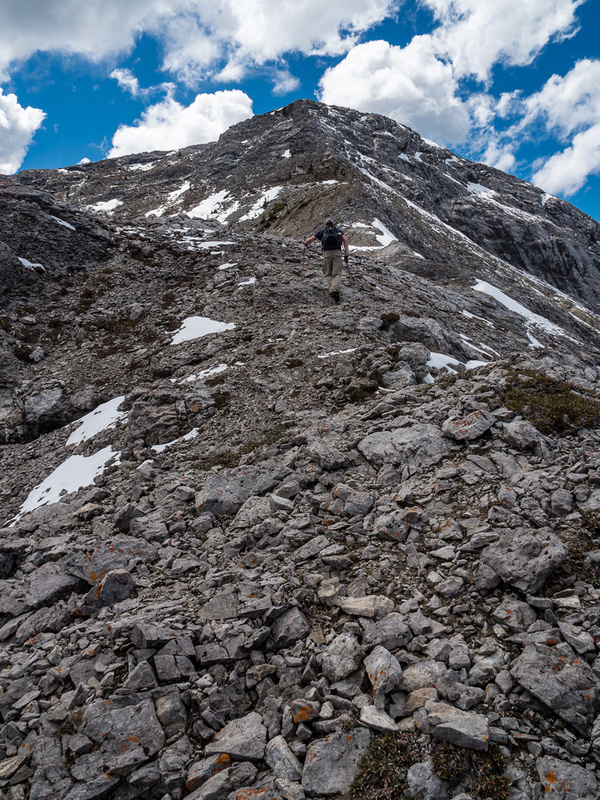 Note the elevation loss in front of us – this is something you’d best get used to on the porcupine loop traverse! 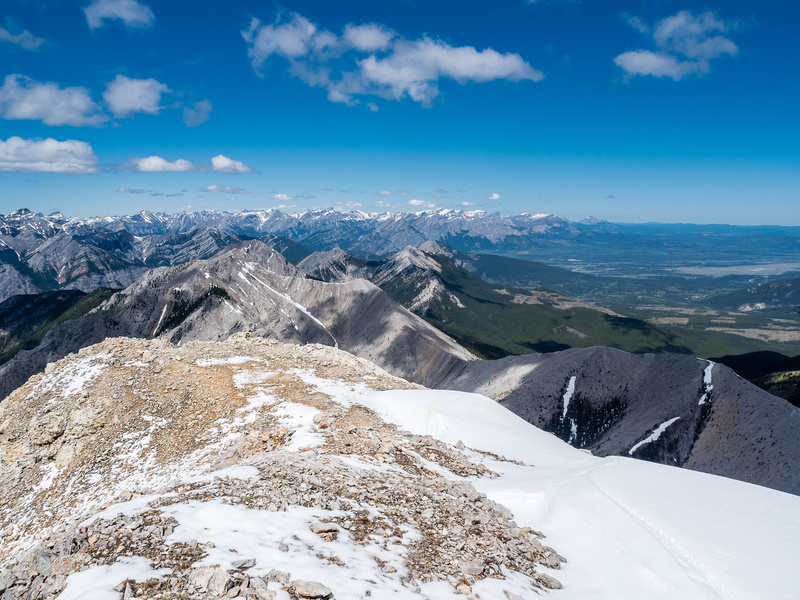 At around 09:20, two hours after leaving the truck, we found ourselves on the first summit of the day, enjoying fantastic views and the most incredible weather you can ask for on a ridge traverse – calm winds and cool air. The summit of the ridge is either right at the pinnacles or as Bob did it, just past them. Either way, the views were decent but we didn’t linger as we could clearly see how much further we had to go. 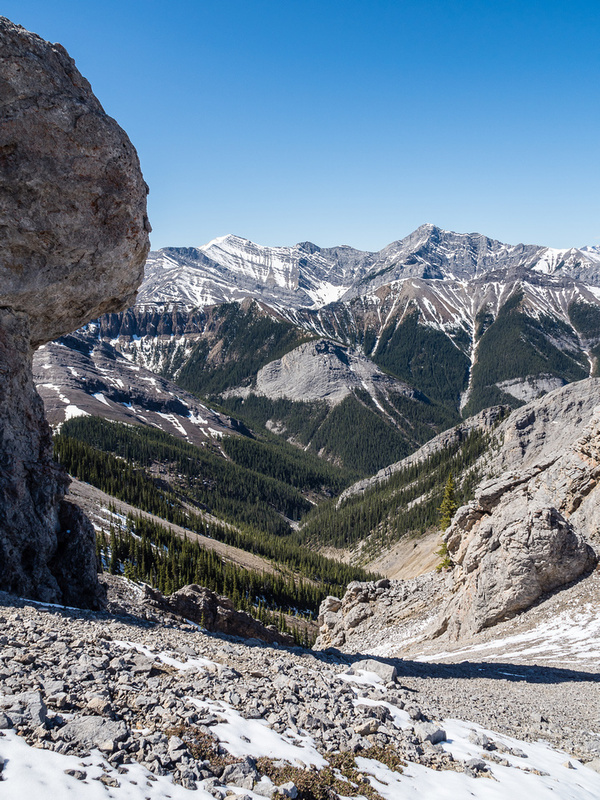 After a quick break, we turned our attention to the rest of the loop – we were obviously barely started at this point even though we’d already completed around 700m height gain and more than a few kilometers. 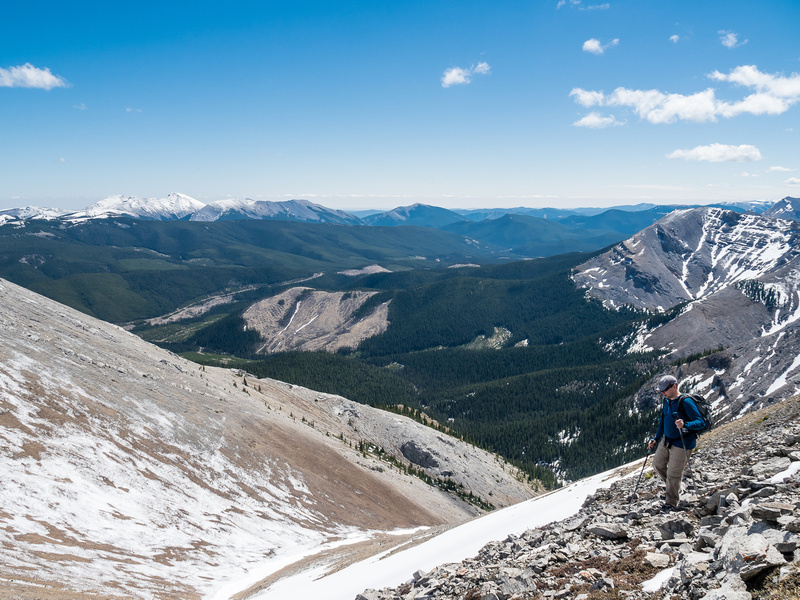 After enjoying the summit of Porcupine Ridge, Wietse and I turned our attention towards it’s extension summit – Porcupine Tower. 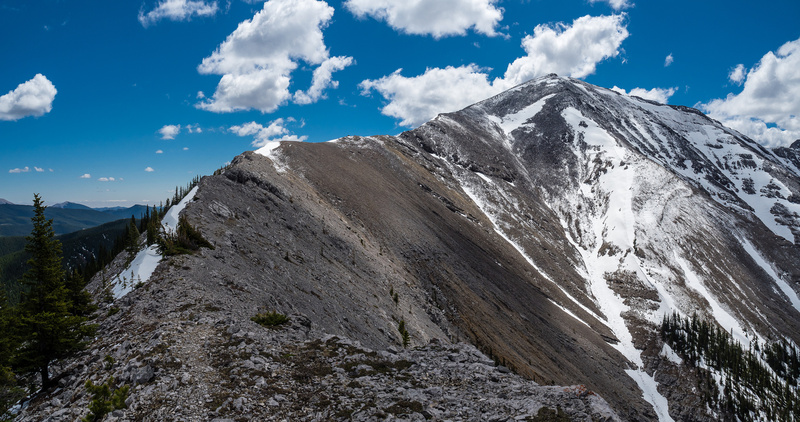 I have to admit, things get a bit interesting as far as naming and claiming summits, especially on long ridge traverses such as the Porcupine Loop. Wietse and I spent more than one occasion chuckling at the fact that likely NONE of the “summits” on this loop are official, yet we were planning on claiming at least 5 or 6 of them on our respective summit lists. Despite the fact that nobody really cares about nebulous, unofficial, front range “summits”, it’s still an interesting point to ponder. 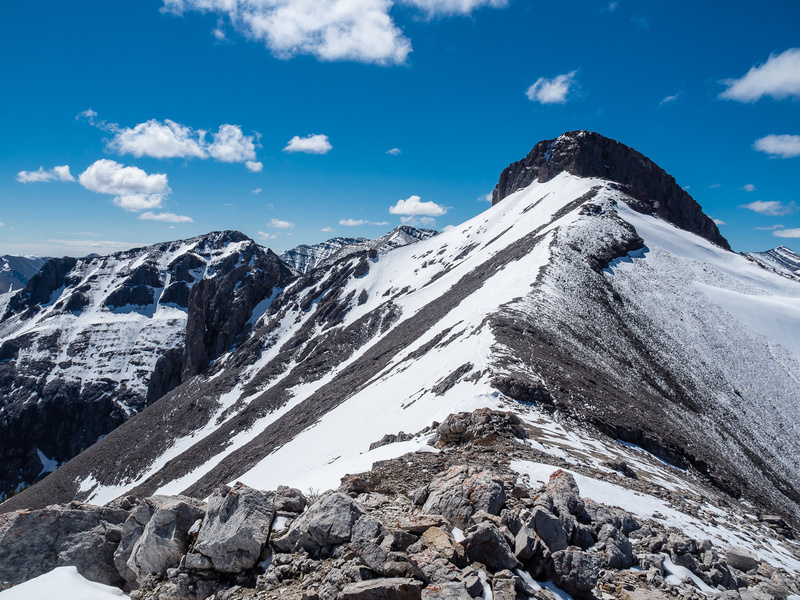 I’ll reason our points for claiming the summits we did, on this loop but YMMV and you are welcome to scoff at our choices and not claim them for yourself. It’s a free world. 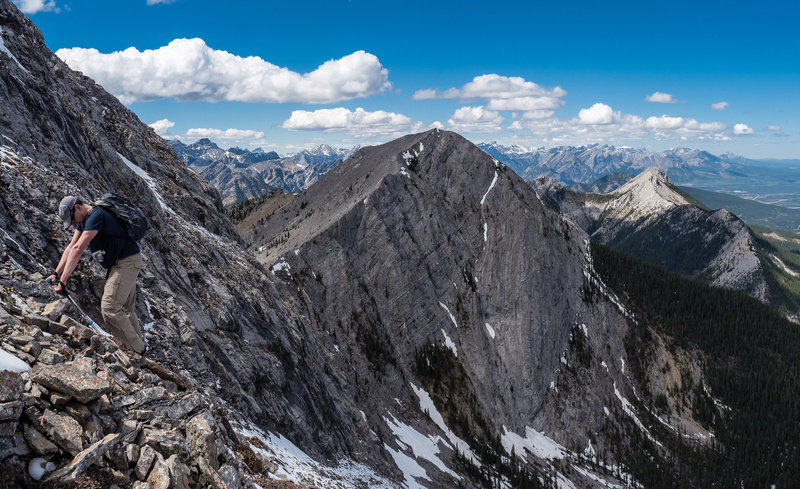 In 2017 Mike Mitchell and I did a similar long ridge traverse in David Thompson Country (the Landslide Traverse) and also claimed a bunch of summits along the way. 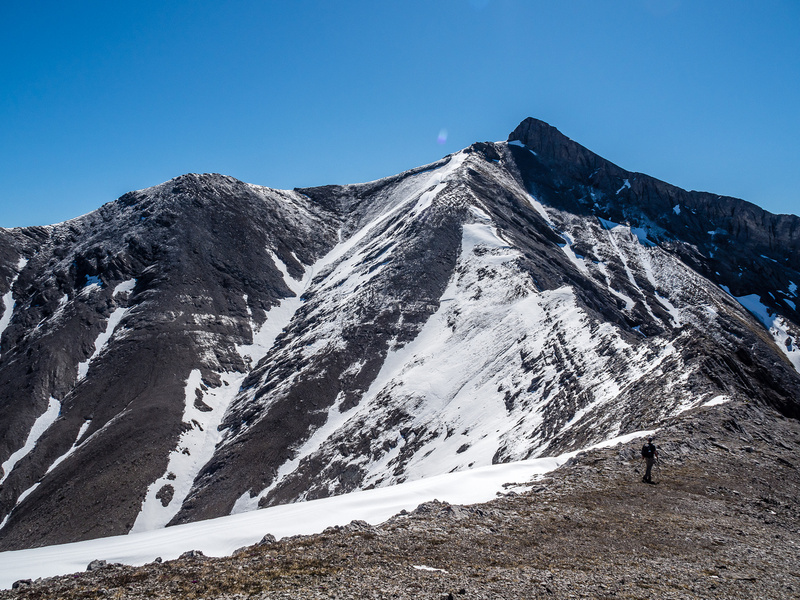 It helps to motivate tired legs and minds when you know you can at least pad your summit stats with these silly long days of undulating ridge lines and exhausting vistas! 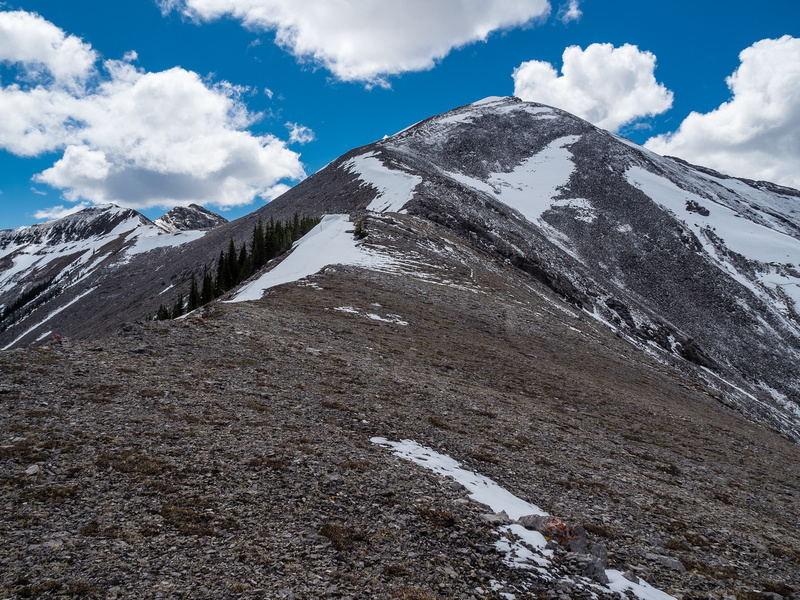 Porcupine Tower is fairly easily claimed as a distinct summit from Porcupine Ridge. 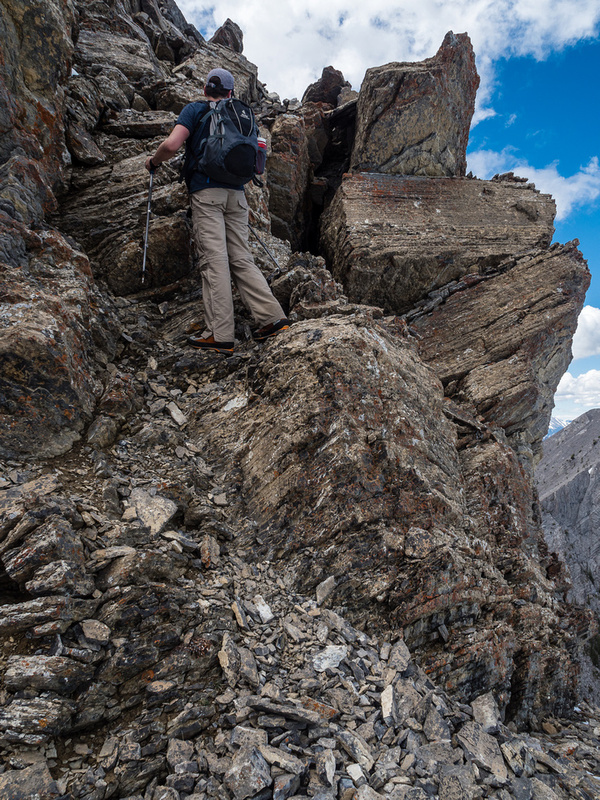 While the ridge is essentially a hike or easy scramble, the tower is much more engaging and demanding. 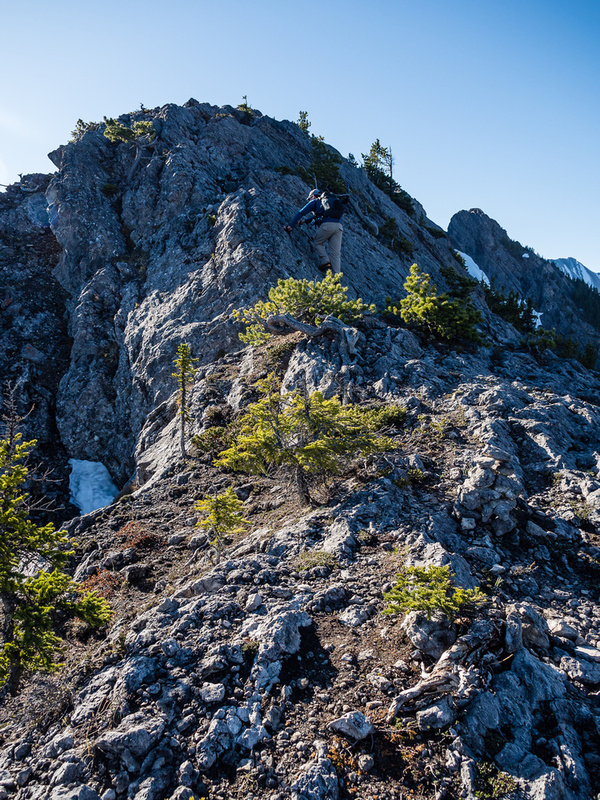 After losing height from Porcupine Ridge, we were pleasantly surprised to find some moderate (exposed) scrambling along the ridge towards the tower. Wietse initially tried to avoid the ridge crest (we thought it was supposed to be only easy terrain) but after running into very slabby terrain which was also wet, he joined me on the ridge proper and we negotiated the crux terrain without issue. We both commented how unexpected and fun the crux was. I’m surprised that folks do this in the winter – it must be clear of snow and ice all year around or it would be very sketchy. We certainly didn’t see any easy or safe way to avoid this section but we commented more than once that we must have missed something. Whatever. 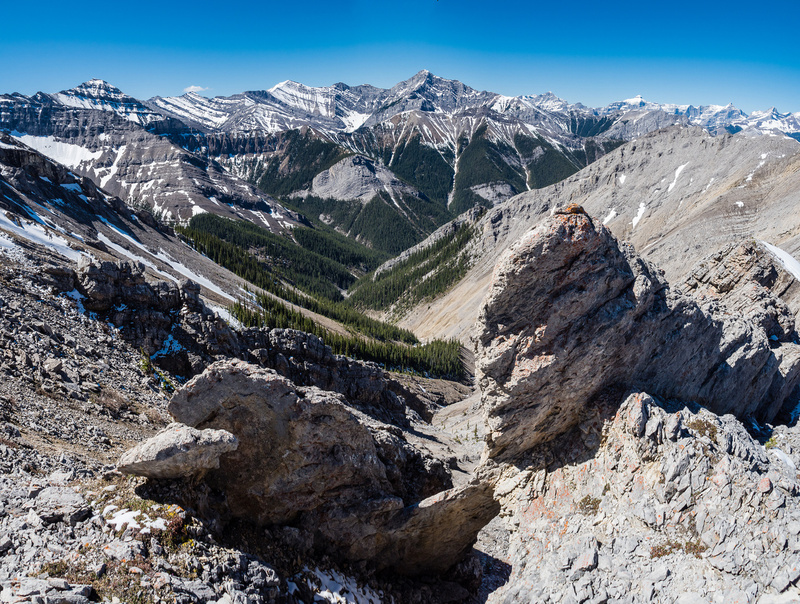 When dry, I highly recommend sticking to the ridge crest as it’s fun and the views are great. An exposed slab corner section which was fun. After the narrow ridge section the rest of the way to the summit of the Tower was fairly benign. 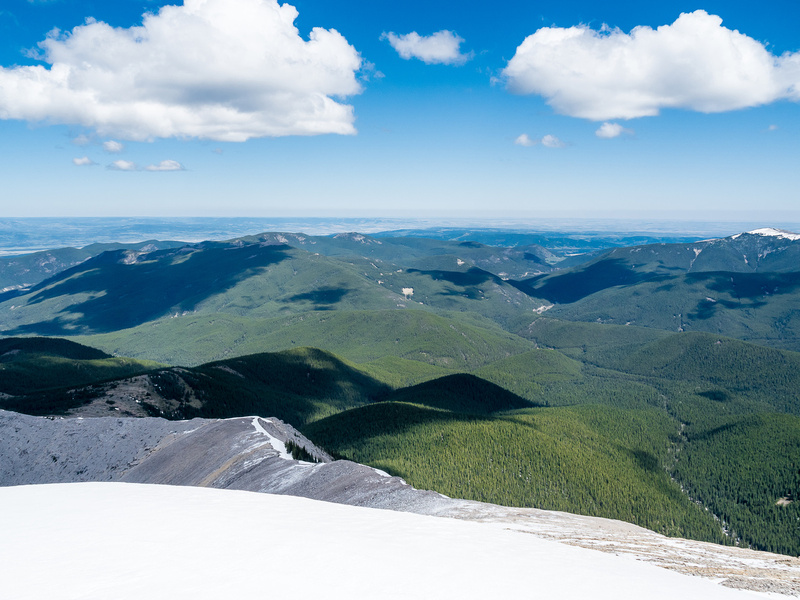 The weather continued to be perfect and our views started opening up as we ascended higher. Summit shot from Porcupine Tower looking back over the approach ridge at left with Crown and Tiara at right. Boundary, Midday and Midnight at center. 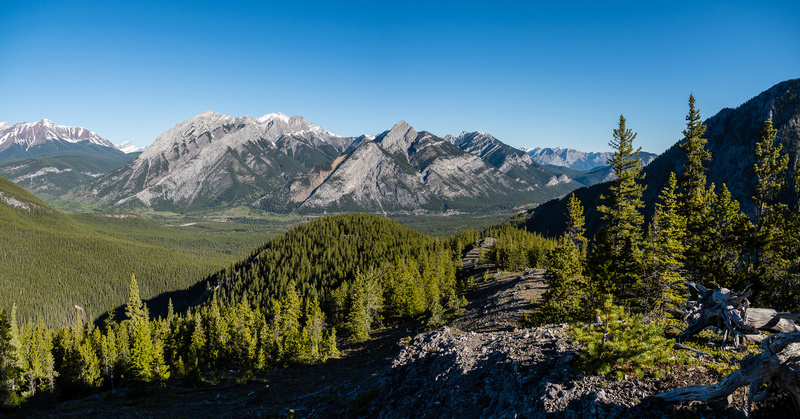 Looking over Wasootch Ridge towards Old Baldy and Mount McDougall. 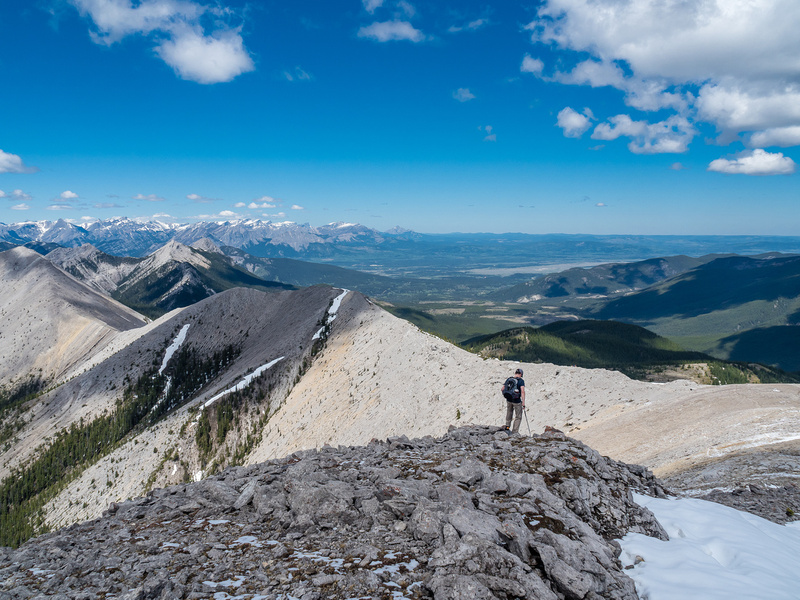 Wasootch Ridge was starting to look close to the same height as our position as we left the second summit of the day and started towards the third – Crown Peak. 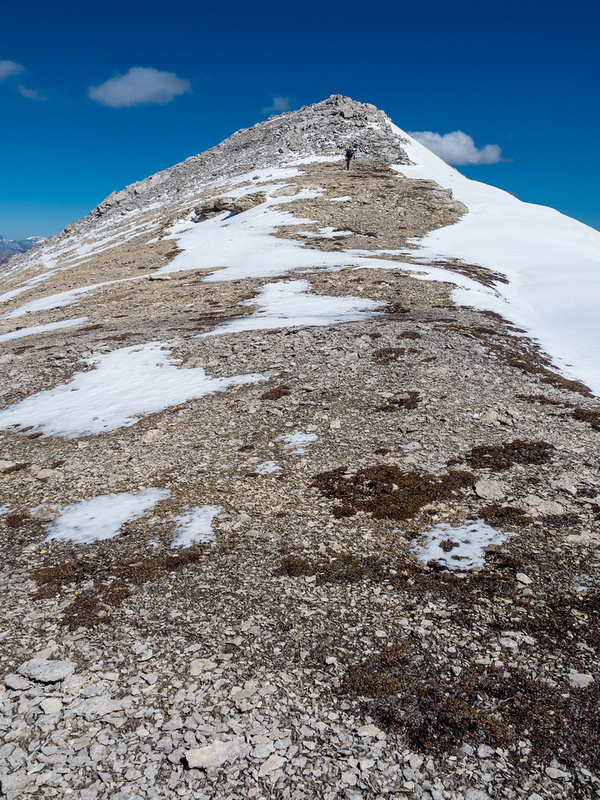 “Crown Peak” is probably the most questionable summit that Wietse and I claimed on our fantastic Porcupine Loop ridge scramble on May 19, 2018. 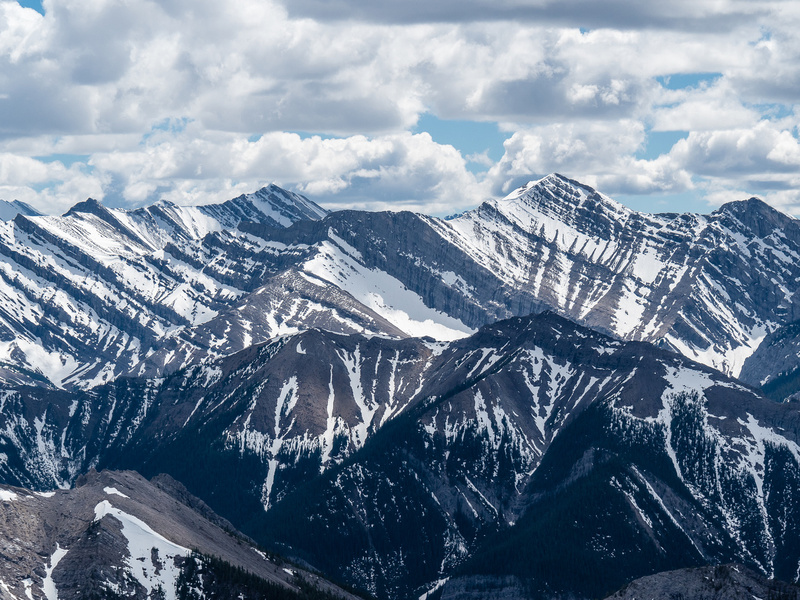 I got the name off the Gaia base map I used to plan our trip, which actually had two summits under the “crown” moniker, both a “West” and an “East” – which I definitely think is pushing the limits of random summit naming and claiming! The reason we claimed it is simple. 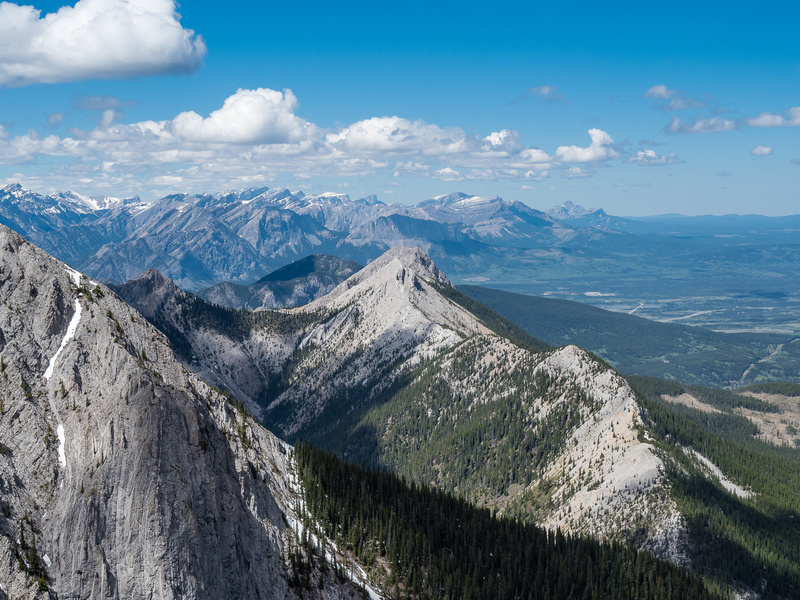 It’s a LONG way from the road, it’s higher than anything we stood on up to that point and it’s distinct enough from its neighboring peaks to justify its own page. Again, YMMV. It’s the Internet – we all get an opinion! 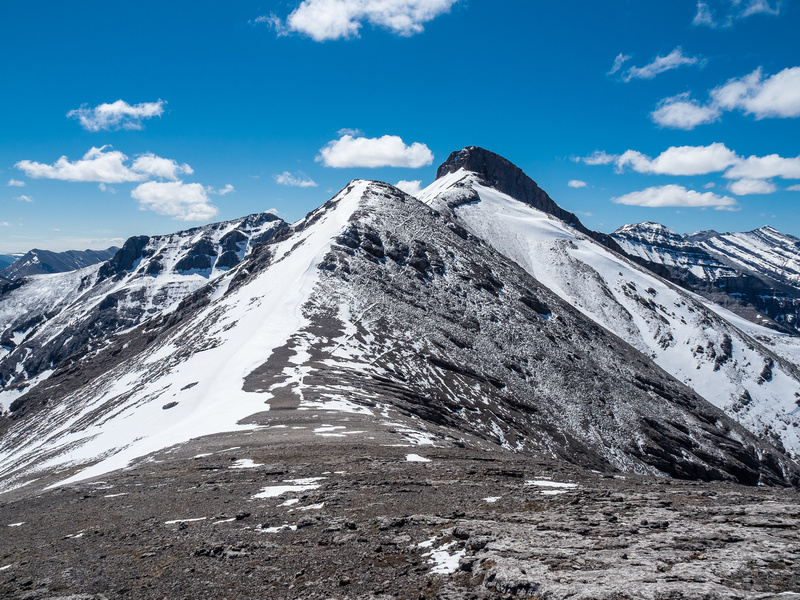 After enjoying a nice break on the summit of Porcupine Tower, we continued on towards the twin peaks of Crown. The weather was unbelievable. There was no wind, the sun was warm and the views were very unexpected. We commented many times that this loop scramble was vastly better than either of us expected it to be. Both of us almost canceled the trip the evening before, since we felt so unmotivated by it beforehand. Well, we were certainly enjoying ourselves now as we walked high above the greening valleys below. 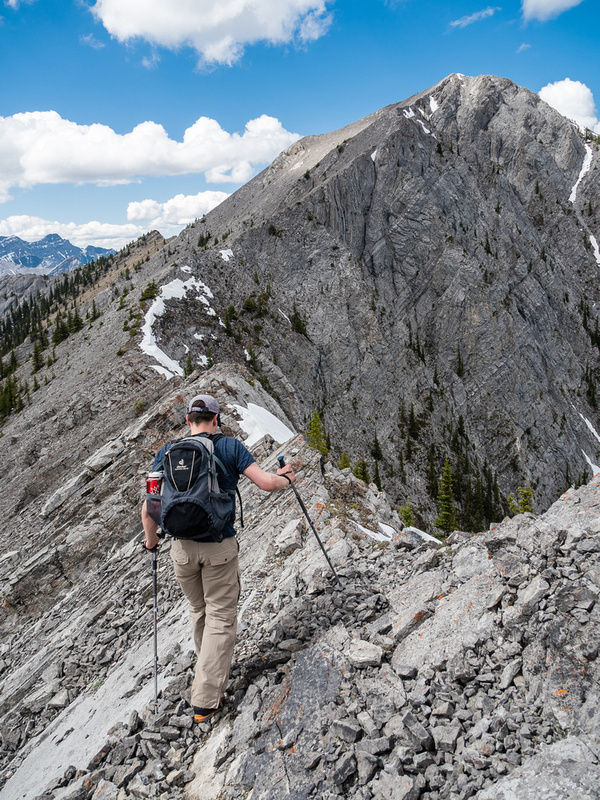 The best part of doing the traverse in a counter-clockwise loop from Porcupine Tower to Midnight Peak, is that every summit along the way gets higher and higher until Boundary Peak and then the scrambling gets more interesting to Midnight Peak. 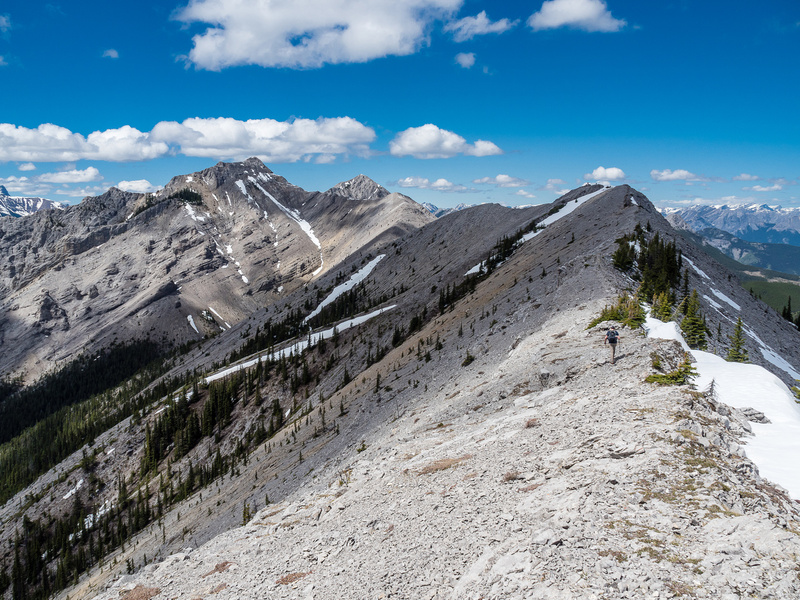 Descending Porcupine Ridge must be a bit demoralizing going the other way, since parts of it are even light bushwhacking. Another advantage of doing the loop counter-clockwise is you up climb the crux on Midday Peak, but now I’m getting ahead of myself. Our route up “Crown West” looks pretty straightforward. 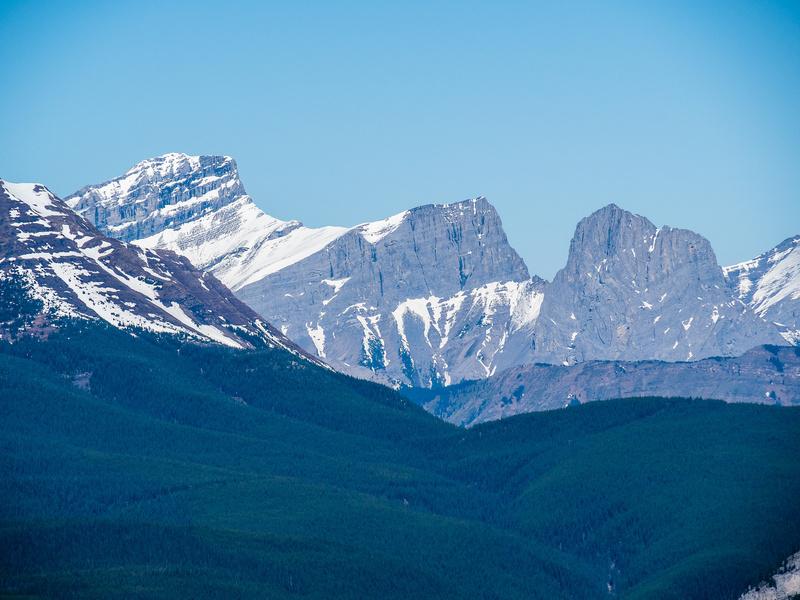 This is the lower of the two “Crown” summits. 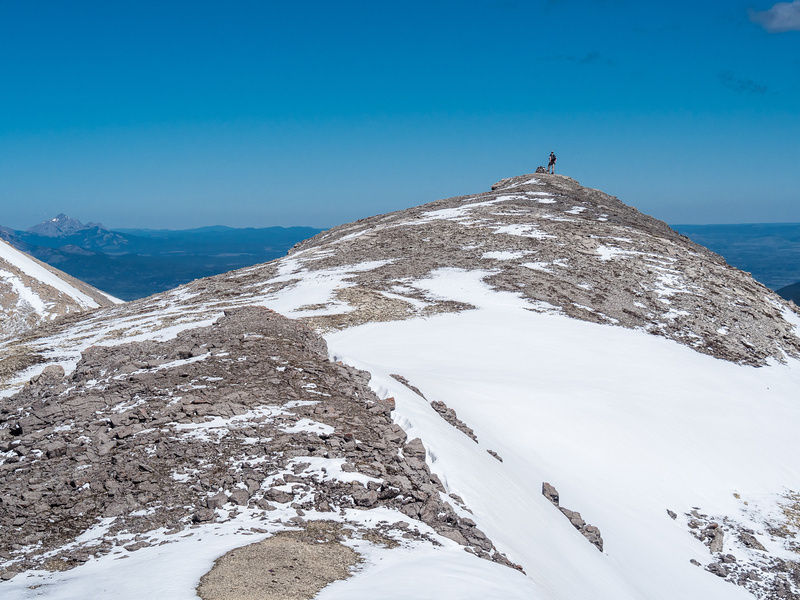 Wietse comes up to the summit of “Crown West” with the higher “Crown East” at center right. Tiara Peak at right and Porcupine Ridge stretching out at left. 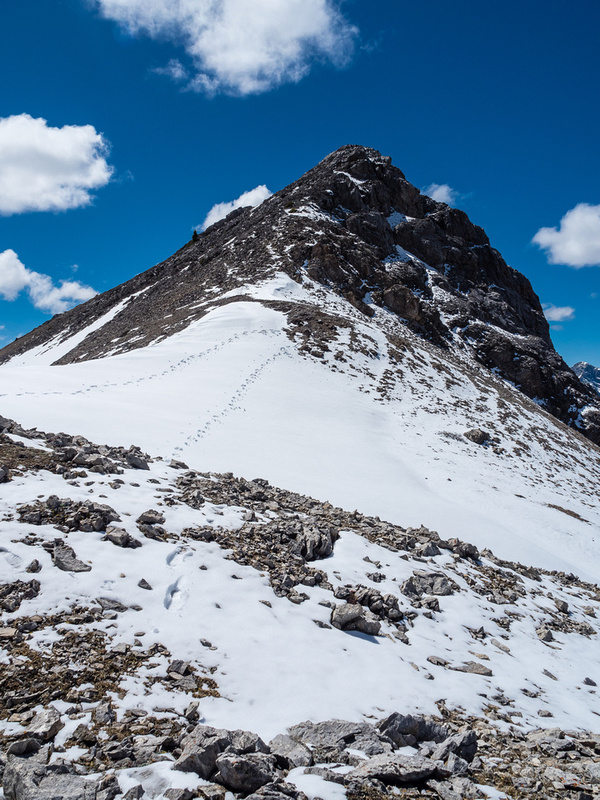 As we approached Crown, we wondered if we’d have to traverse to a higher point off the west summit, but actually the east summit is the highest one and we quickly traversed over to it. Again, great views kept us entertained and the fact that each subsequent summit was higher than the previous one, added some motivation to keep going. 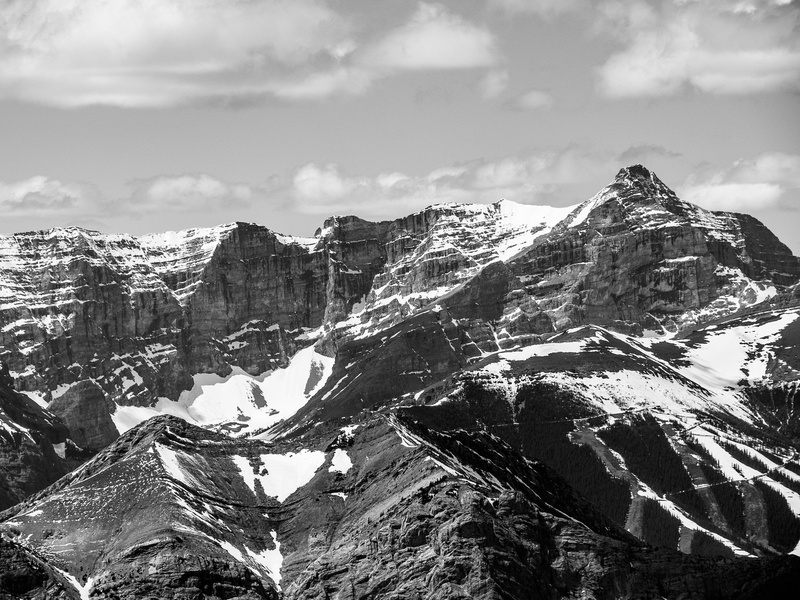 Tiara Peak looked really nice from Crown, as did a surprising number of other visible summits. The views towards the rest of our traverse looked a bit tiring from the summit of Crown Peak, if I’m honest. At this point we were only 4 hours into our day, but we weren’t dawdling and it was obvious that the most work was still ahead of us. Boundary Peak was looming quite a bit higher and we had more height to lose (!!) before trudging up the snowy slopes under Tiara’s west and north aspects. 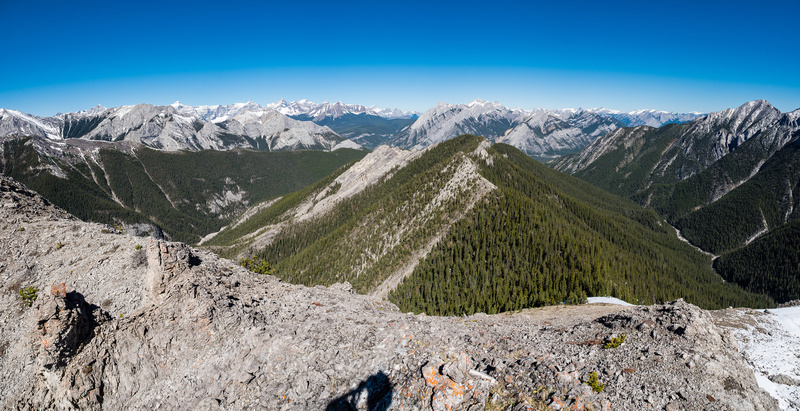 Boundary Peak was the highest point on Wietse and my 21km, 1700m+, 10.5 hour Porcupine Loop traverse. 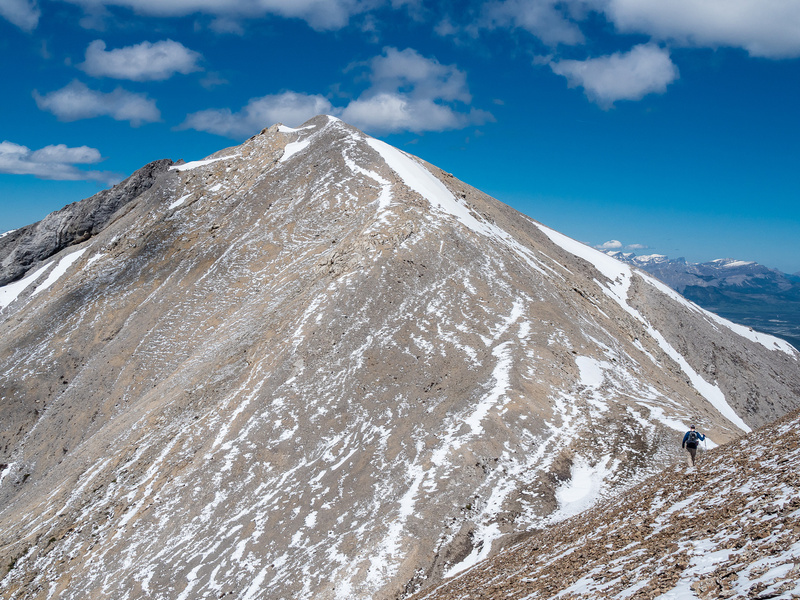 As we started the seemingly long trek from Crown Peak towards Boundary Ridge, we were starting to realize that this is a pretty big day – especially for a bunch of front range, unofficial summits. It was also a gorgeous day. Perfect for ridge hiking in every way. No wind. Not too hot. Great views. 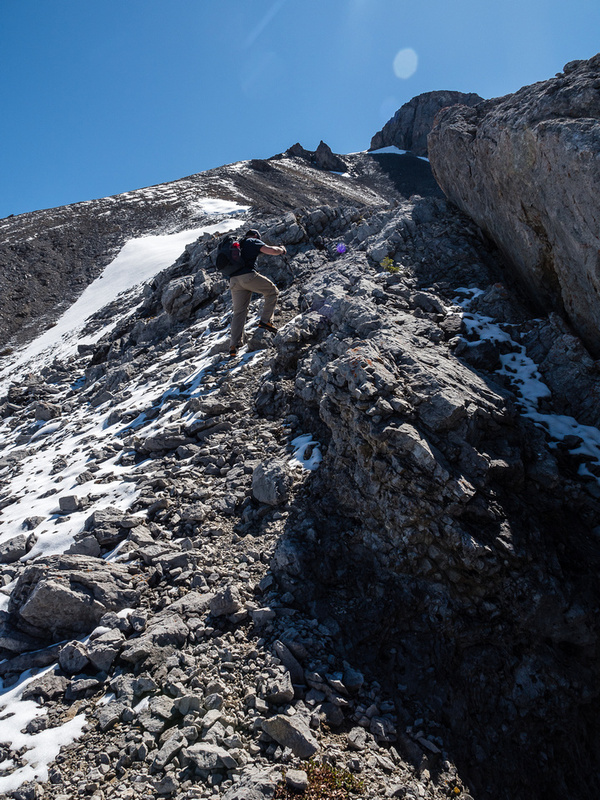 We were enjoying ourselves very much as we dropped to a low point between Crown and Tiara before starting back up yet another scree / rock ridge slope on the traverse. There was some brief, enjoyable, easy scrambling on a rocky ridge before we ascended scree and started a snowy traverse to access Boundary Ridge (which I’m NOT claiming as a separate summit ). 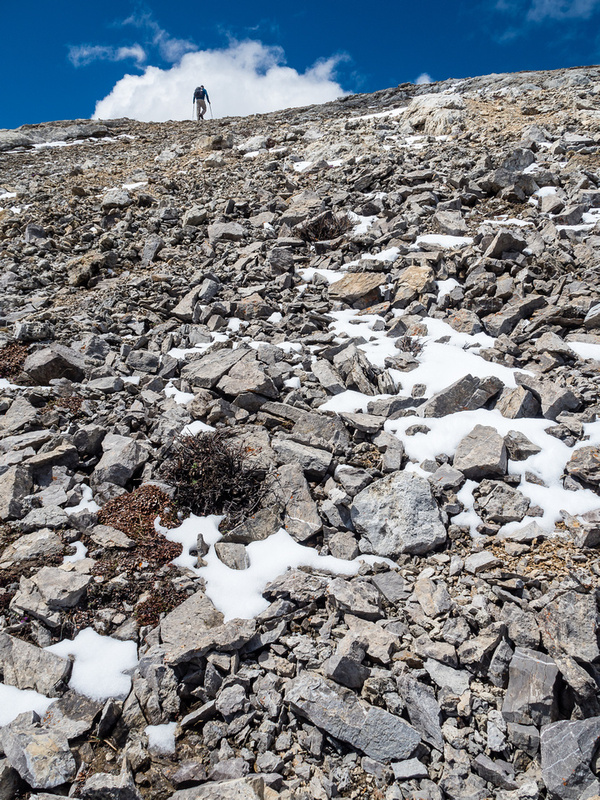 The snow traverse was awesome, providing some relief from scree but also some great alpine feel to our long day. 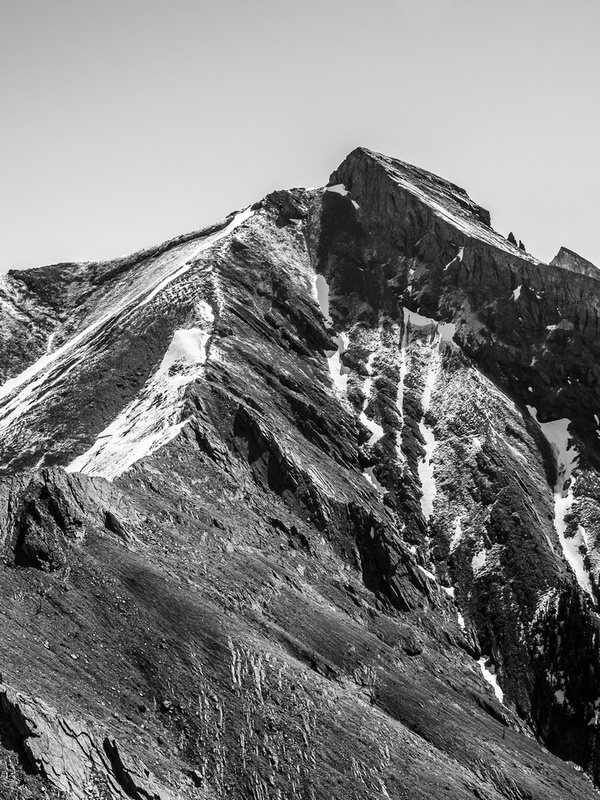 Tiara Peak looked fantastic from north of it’s summit block. 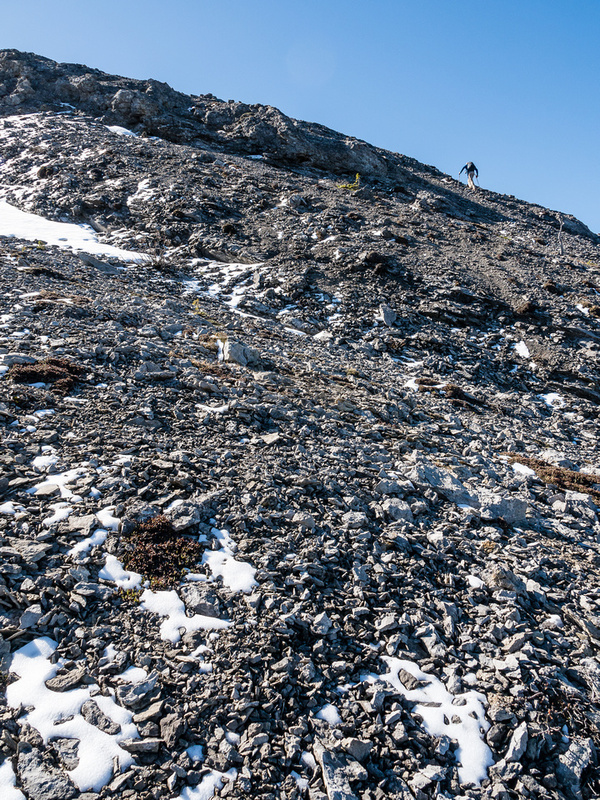 Wietse and I had good memories of a late November day, over a decade previous when we were last on this ridge as part of our Belmore Brown / Tiara Peak scramble. 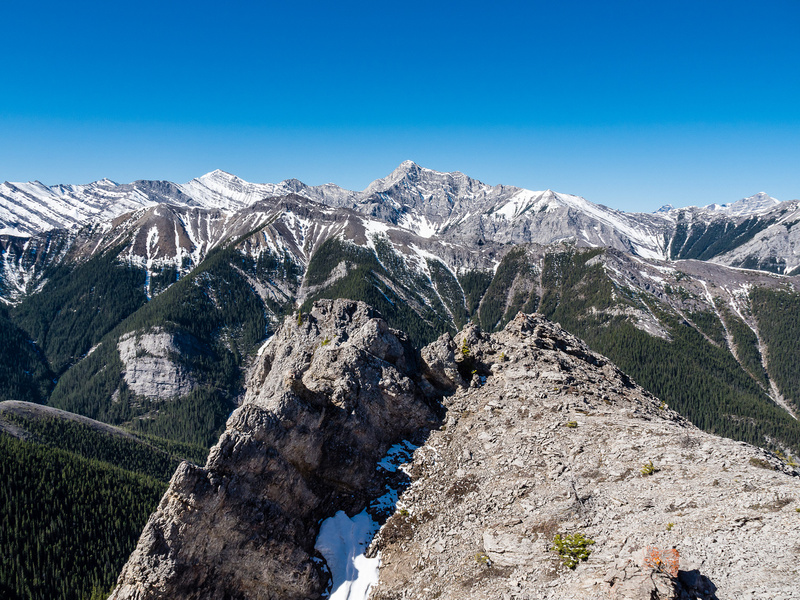 The ridge from Tiara’s north cliff face to Boundary Peak was very enjoyable. We both commented more than once how good we were still feeling at this point. I think it’s because although our pace wasn’t slow, we did take time for the occasional break and I was taking a crapload of photos for some reason which tends to give me lots of short breaks. 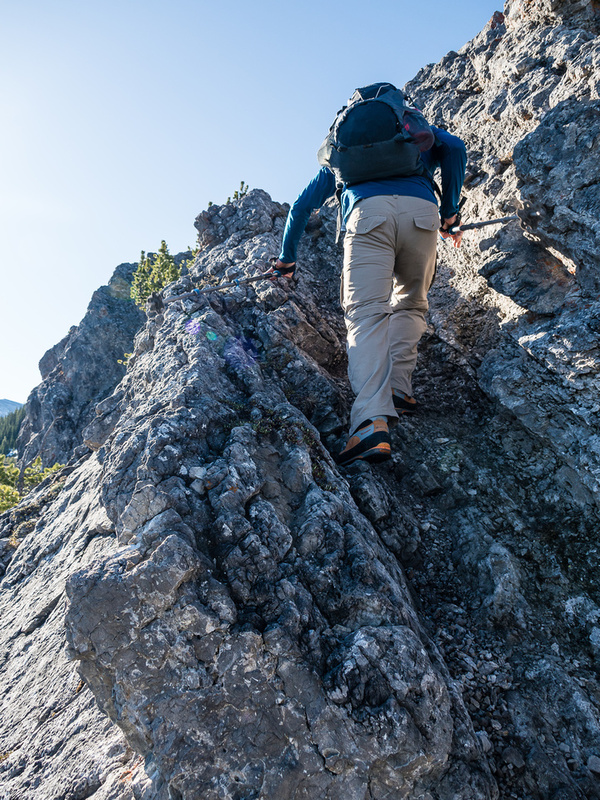 There were a few sections with easy to moderate scrambling – mostly downclimbs – but they were low consequence and not an issue. As usual there were plenty of dips along the way too, the elevation gains were slowly adding up by the time we finally topped out on the highest point of our day, past the half way point at around 13:00 or 6 hours into it. 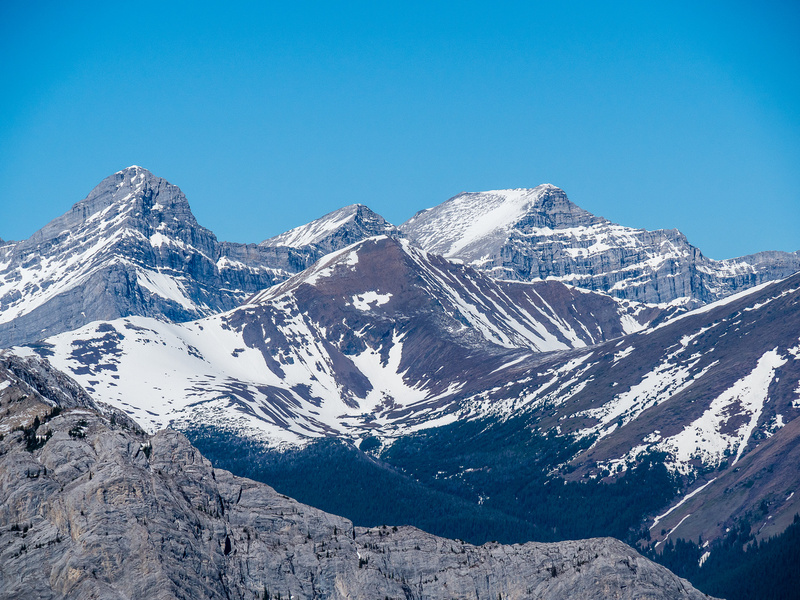 We’re now much higher than Crown Peak and much much higher than Porcupine Ridge / Tower (C). Wasootch Peak at middle left is also much lower than us. 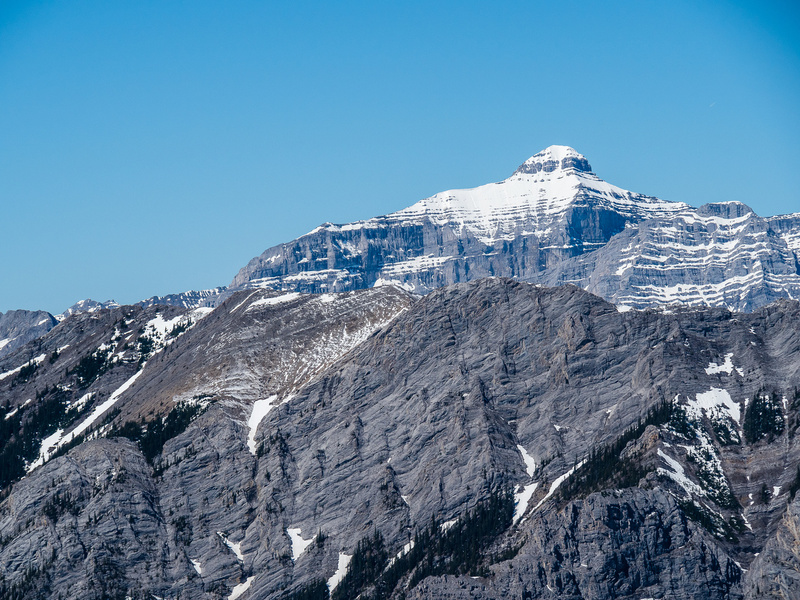 Looking up at Tiara’s north and east (L) face from the ridge. 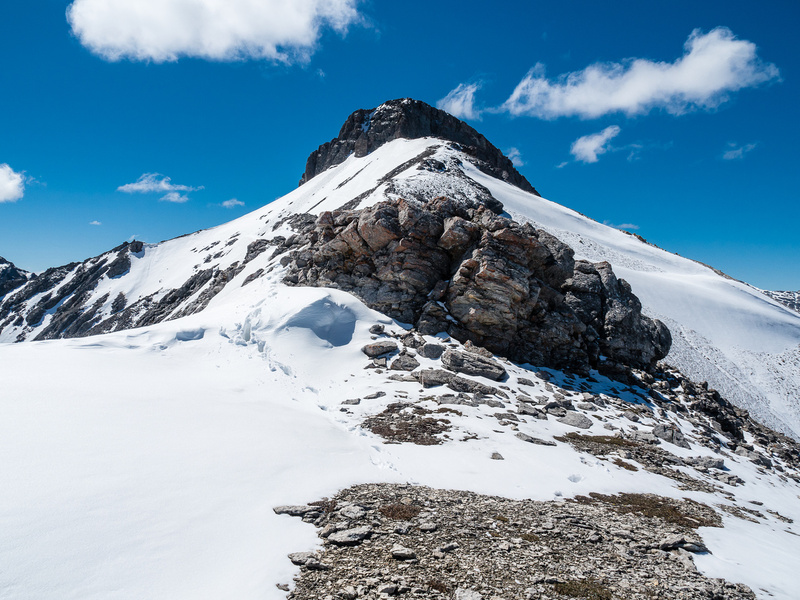 I wouldn’t want to be crossing that snow slope right now – but there were fairly recent tracks across it right at the slide. As we enjoyed the views, especially towards Baldy and the Midday / Midnight pair of summits, we heard voices approaching on the ridge below. When we started down the long, snowy connecting ridge towards Midday Peak we saw other people for the first time. Boundary Peak finally comes into view. But it’s not the close one – it’s the far one at left! From Boundary’s east ridge looking back at the two main bumps we’ve come over towards Tiara Peak at distant right. At this point on a gorgeous spring day on May 19, 2018, Wietse and I were already over 6 hours into our day and a LONG way from our vehicle. 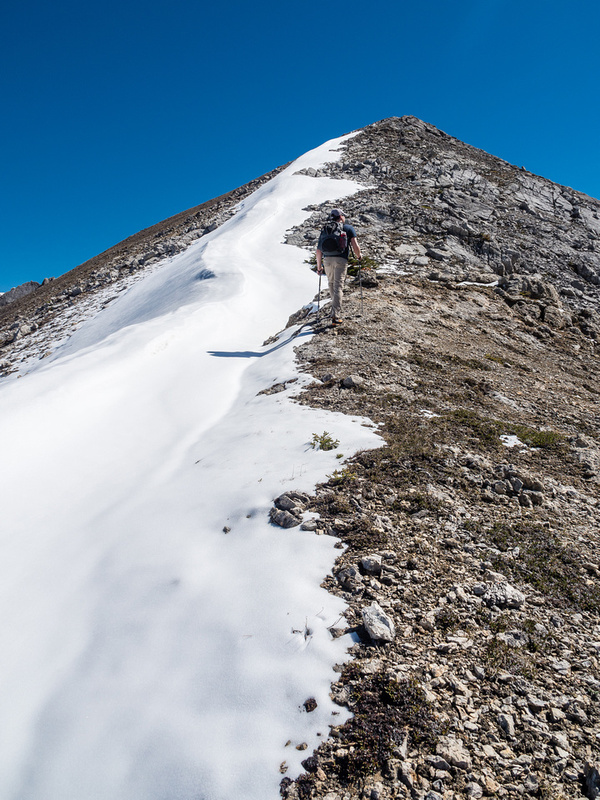 As we descended the easy, snowy NW ridge of Boundary Peak towards Midday Peak, we also met other people for the first time that day. 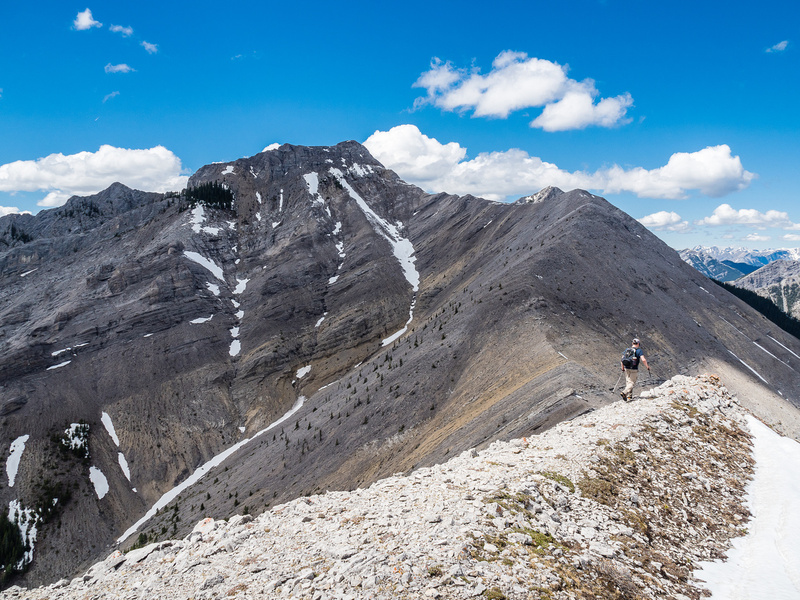 A gaggle of trail runners with their ridiculously light packs and physically fit bods ran / walked past us as we exchanged brief greetings and assured them that Porcupine Ridge was easy and fun. After descending to yet another low saddle, this one between Boundary Ridge and Peak, we heard more voices ahead and spotted a large group on the ridge above us. As we ascended towards them and greeted each other, we quickly realized this was the large group that had 4 or 5 vehicles parked in the ditch that morning before we got there. They had obviously walked up hwy 40 and were busy completing the Porcupine Loop in a clockwise direction. It sounded like they might be interested in adding Tiara Peak to the list, which would make for a VERY long and full day! We cautioned them a bit about the snow loaded east slopes that we’d noted from Boundary Ridge before parting ways and continuing on our ways. Midday starts to look like a peak as we approach it along the ridge (C). 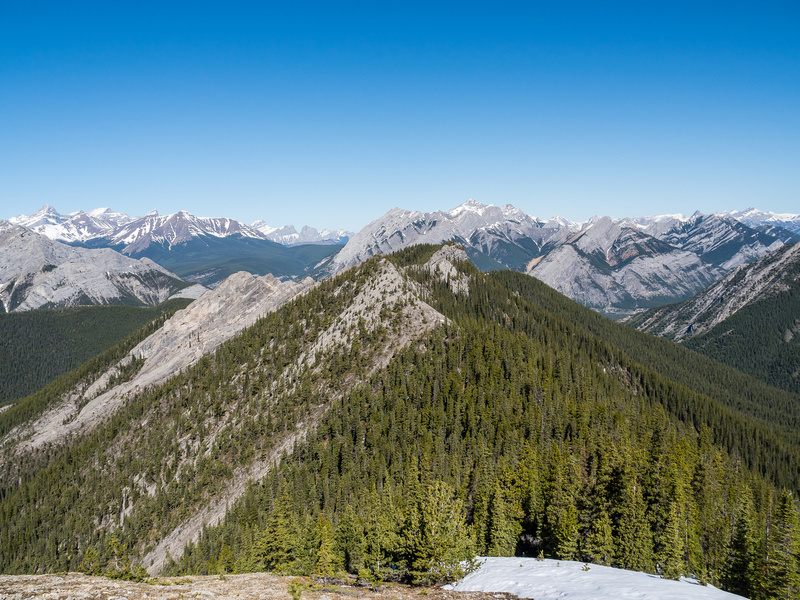 There was a surprising amount of height loss between Boundary Ridge and Midday Peak. Thankfully it was fairly quick and easy and our views were still pretty neat, especially the unique perspective on Baldy’s three summits. 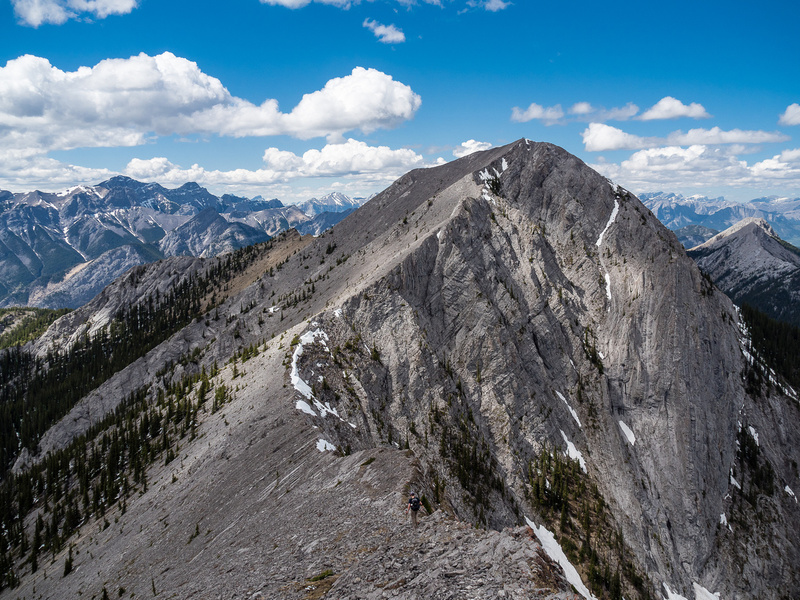 The east ridge of Midday looked intimidating from afar but we knew it was only supposed to be moderate scrambling so we got our noses into it. With some lingering snow and wet rocks it certainly was “moderate”, but no more than that. 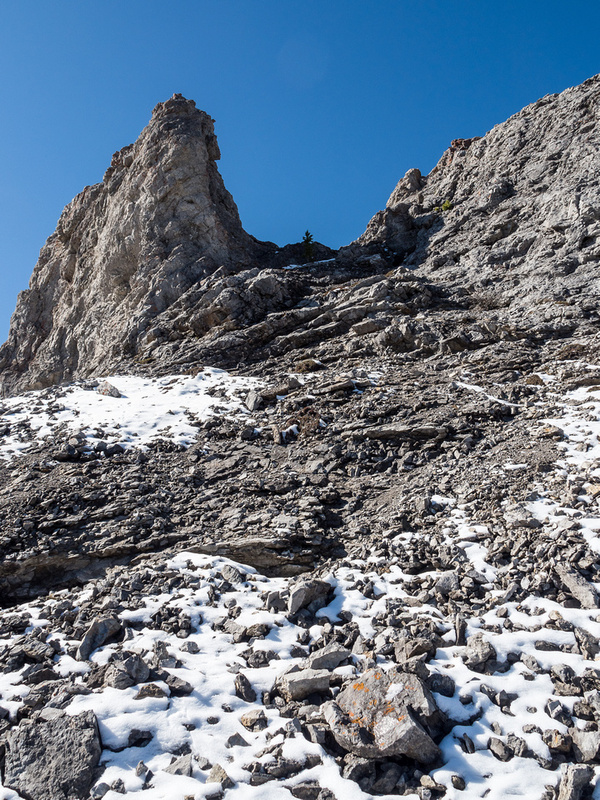 I could see it looking fierce from the other way, but upclimbing the crux is almost always easier and was one of the reasons we were going counterclockwise – in case of snow / ice on this section. Starting up the crux on Midday Peak. Great views off the crux ridge on Midday Peak. Looking down the crux on Midday Peak. After a fun, exposed scramble we were finally on top of our 5th peak of the day, roughly 7.5 hours and over 15km from the truck. Some afternoon clouds had been slowly building as we ascended, but these were the welcome, puffy kind of afternoon clouds, that only offered brief respite from the sun and didn’t come with goodies such as lightning, hail and wind – yet anyway. Another short break to drink the last of my Starbucks coffee and choke down some food and we had a decision to finally make. 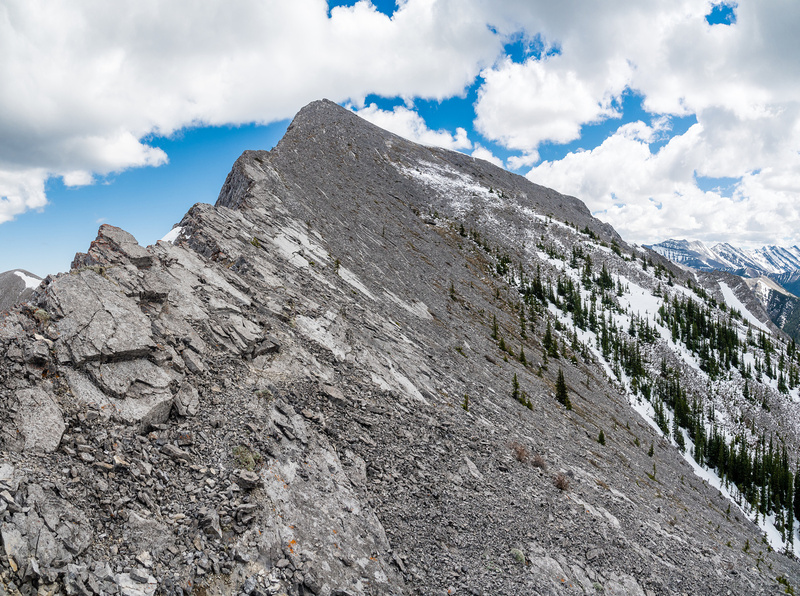 A great panorama showing our entire ridge traverse up to the summit of Midday Peak. 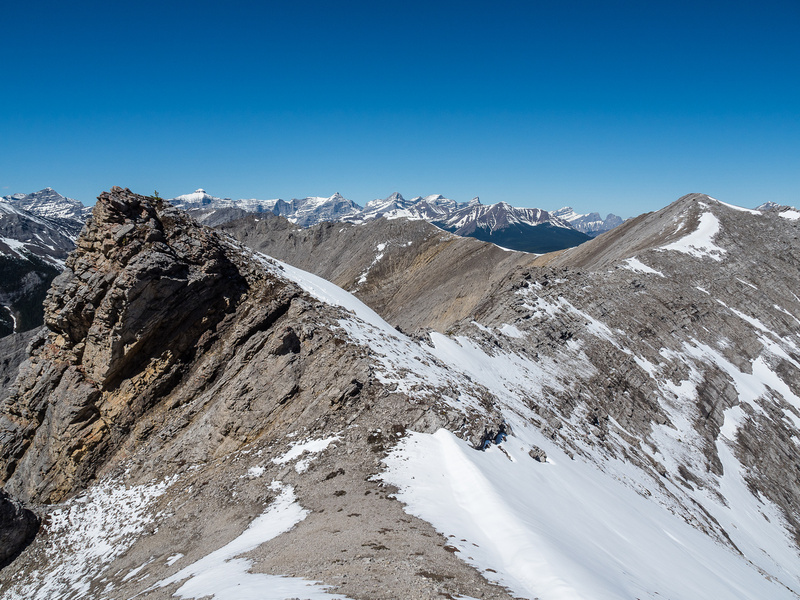 It starts at lower right at the end of Porcupine Ridge, leading to center under Tiara Peak before coming over Boundary Ridge at left and then up to the summit. With the route agreed on, we started the descent down towards Midnight Peak. 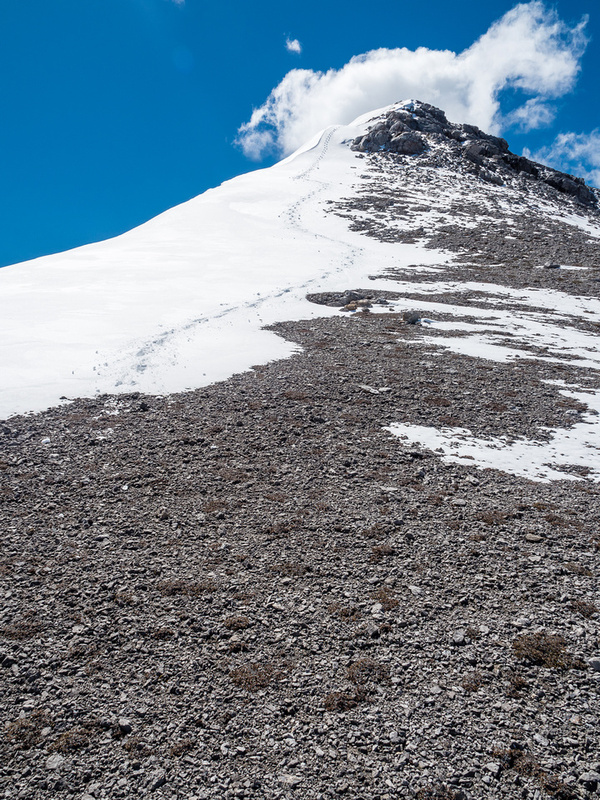 After taking a short break on the summit of Midday Peak, Wietse and I started our descent towards Midnight Peak – noting three figures standing on top watching our progress. 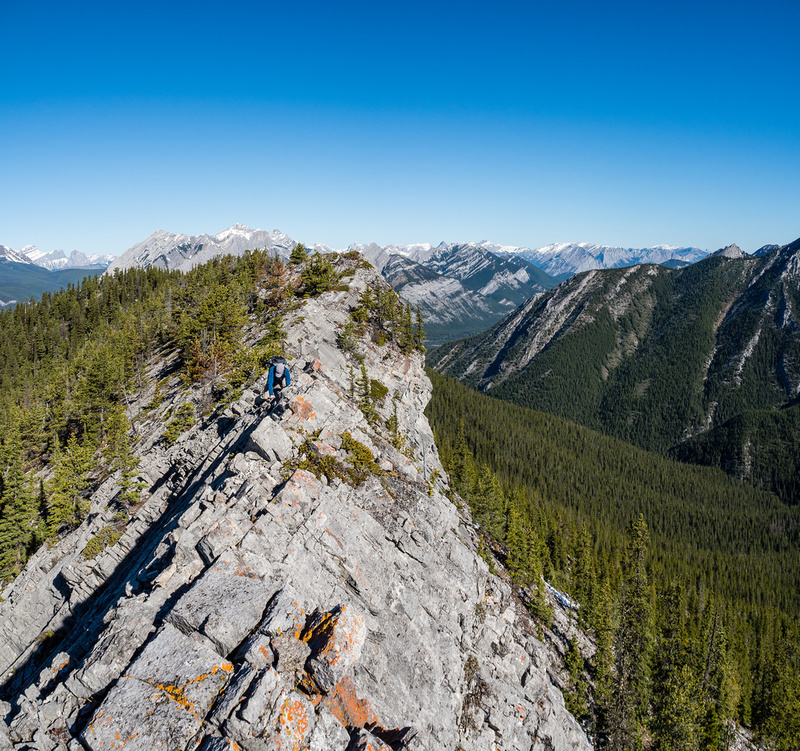 As the three tiny figures slowly dropped down the alternate west ridge egress from the summit, we slowly made our way up our last peak of a long day spent traversing the Porcupine Loop from Porcupine Ridge to Tower to Crown to Boundary to Midday to Midnight. Although our progress was slower than earlier in the day, we still only took around 50 minutes to drop down to col and reascend Midnight. Looking back at Midday, it’s slopes looked much steeper than they were and much more dramatic. Another great view back towards Midday Peak. The views from Midnight were somewhat familiar with the views we’d been having all day already. 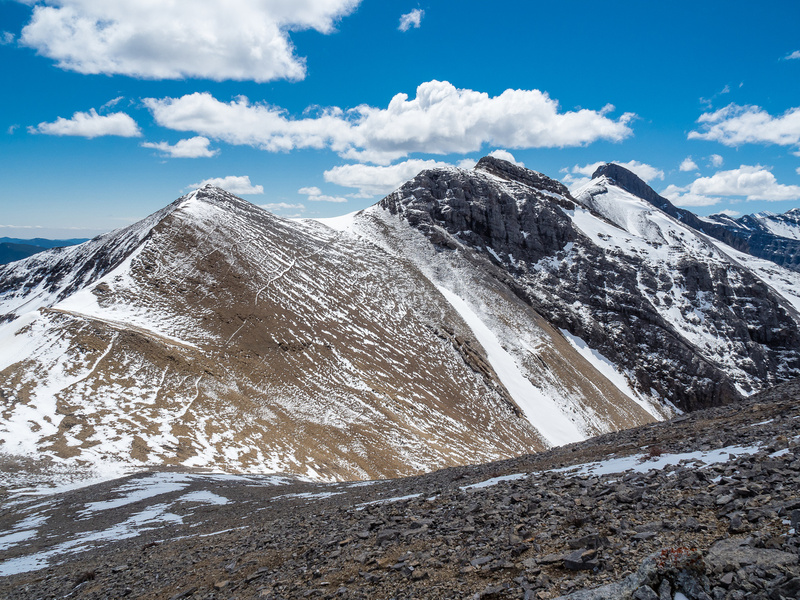 The summits of Baldy Peak looked pretty cool from here, as did some of the other front range and even not-so-front range peaks such as Fortress and Gusty way over by Chester Lake. We didn’t linger as we were 8.5 hours into our day and still had some unknown terrain ahead of us. 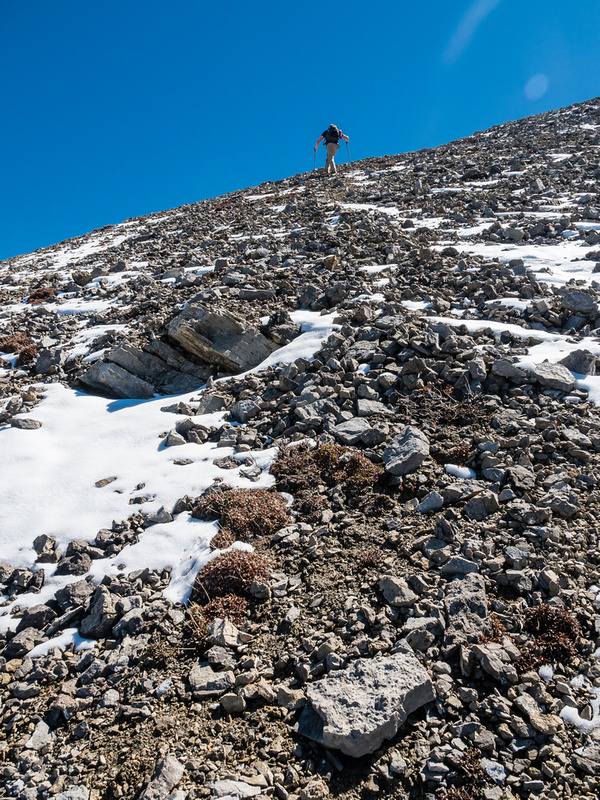 We easily and quickly dropped down the west ridge of Midnight Peak and soon caught up with the three folks that we’d seen earlier on the summit. They were quite lost. Color me grumpy but I don’t have much patience for folks who force themselves up a peak (they were already uncomfortable with the easy ascent from Baldy Pass) and then take an alternate, much more convoluted and difficult route down to avoid their initial mistake by making a worse one! Oh, and they don’t have a map or even a free GPS app on any one of their 3 iPhones. We gave them some route hints and cautioned them very strongly NOT to follow us, since we were going down the opposite side of the ridge than they should be. 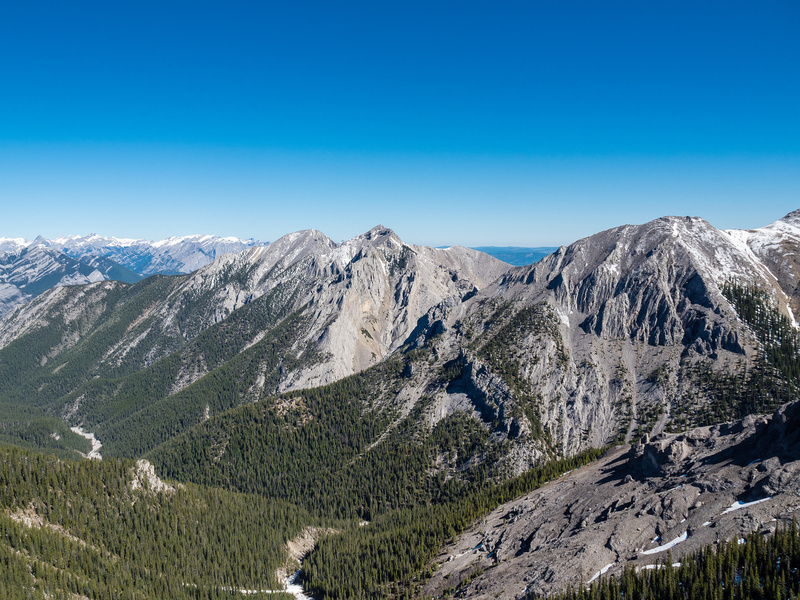 A good perspective on the Porcupine Creek (L) and Baldy (C) drainages from the west ridge of Midnight Peak. 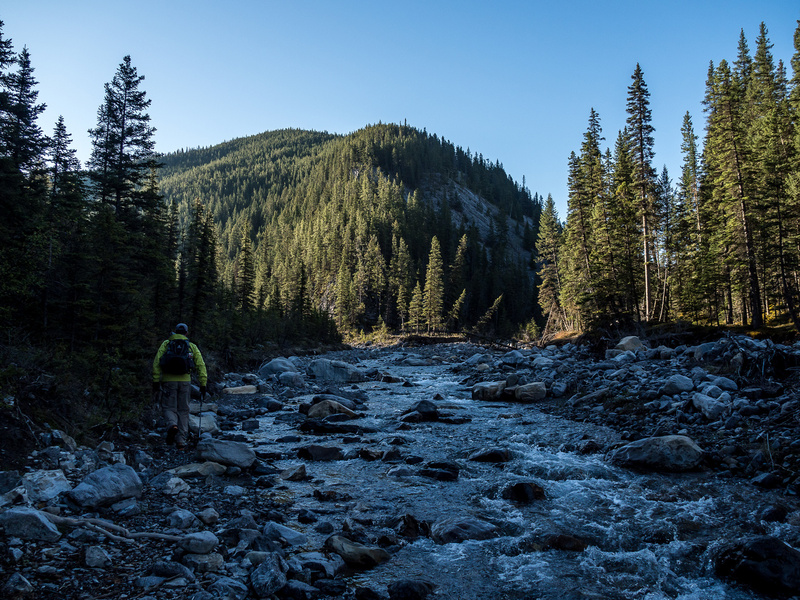 It turns out that the south slopes of the west ridge of Midnight leading down to the North fork of Porcupine Creek are fantastic! 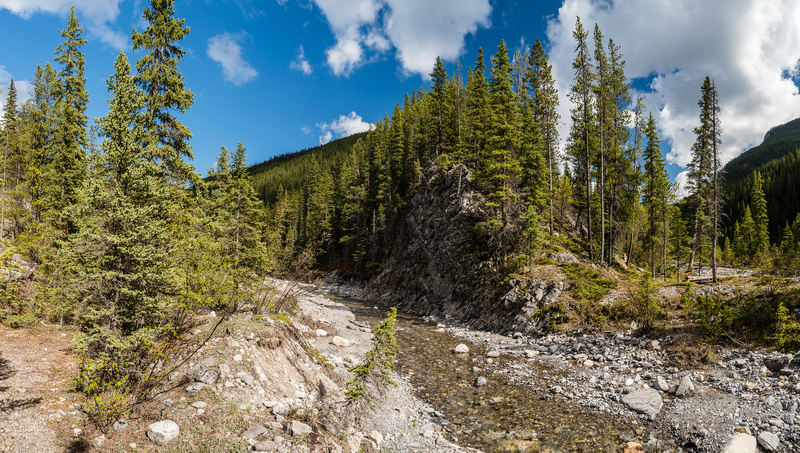 We descended very quickly on a dirt / scree mix of soft ground and easy, light forested slopes right to the creek. This was very unexpected given some beta we’d garnered from others who’d descended around my initial intended route directly off of Midday’s summit block. 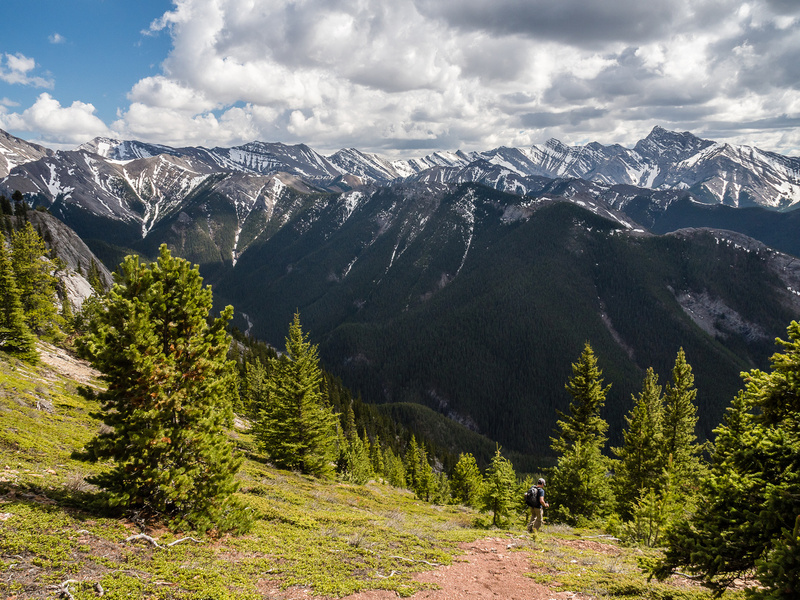 Our route worked so perfectly I have no idea why anyone would bother going up (or down) the Baldy Pass trail to access the Porcupine Loop traverse. 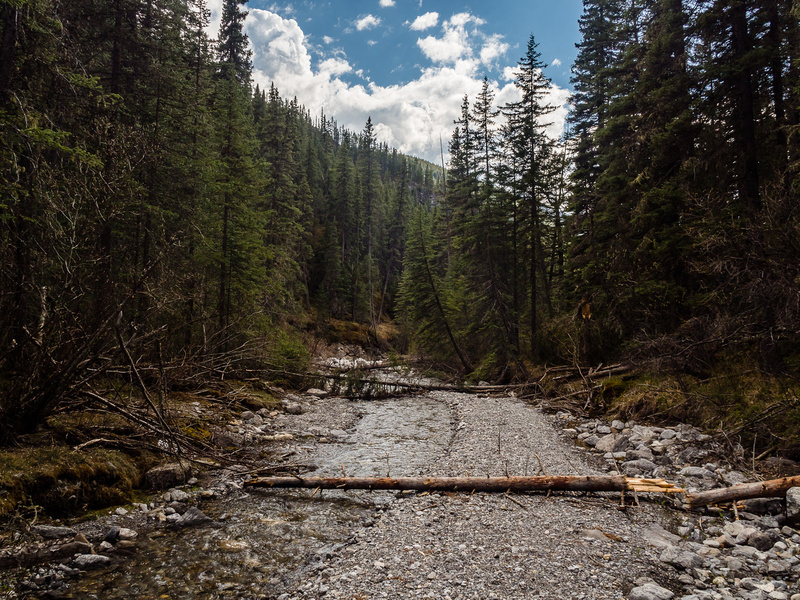 The exit down North Porcupine Creek was also quick and unobstructed by any debris. 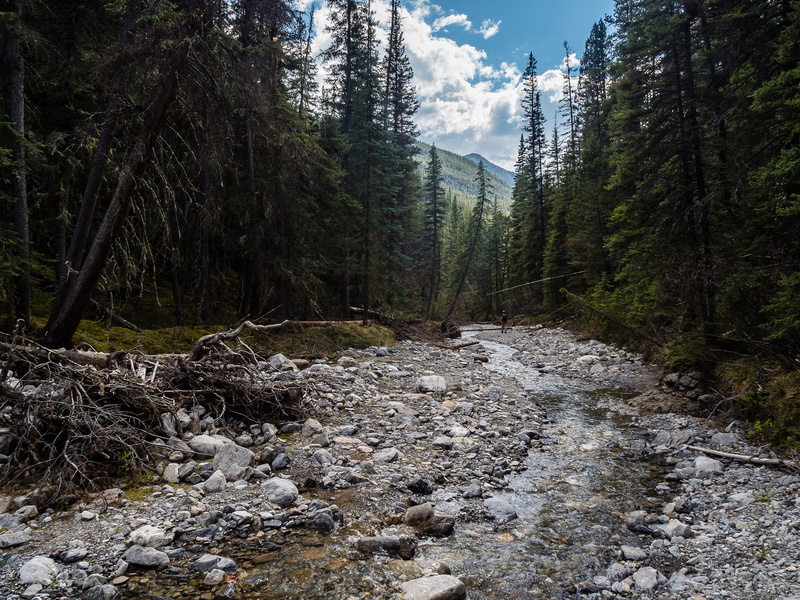 The best part was that there was actually water flowing – unlike my experience in the Wasootch Creek drainage. We trended slightly to our right (west) here, after dropping off the west ridge of Midnight, to avoid the rocky drainage since the forest was open and fast. We arrived back at the truck around 10 hours and 20 minutes after leaving it. 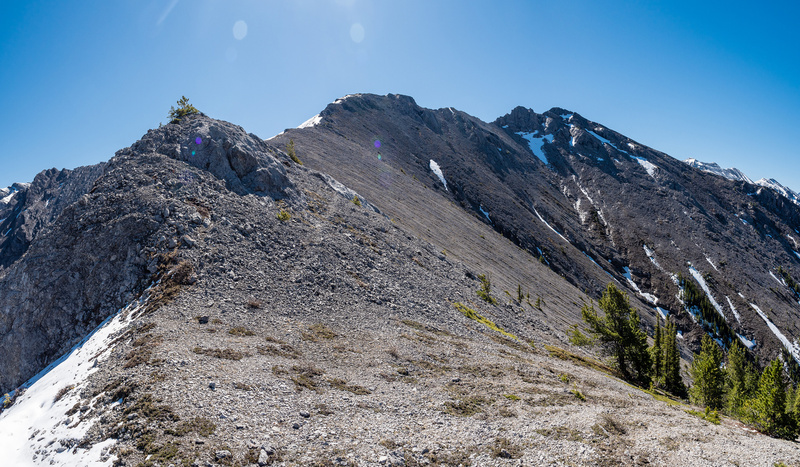 I enjoyed the Porcupine Loop Traverse much more than expected and can very highly recommend it as an early season objective as long as the crux sections are dry or at least melting and snow free. Great description of this entire loop Vern! I just did Midnight and Midday yesterday. Not sure I have it in me to do the entire loop. Very enjoyable to read though. Take care!